Hey Dogleggers, long time no talk! I promise I haven’t forgotten about you guys—I actually daydream about blogging quite often. For those who don’t know, I’m currently in my junior year of college, so let’s just say that I have to write a lot of stuff that’s not about disc golf during the school year and my brain can only produce so many words in a week. 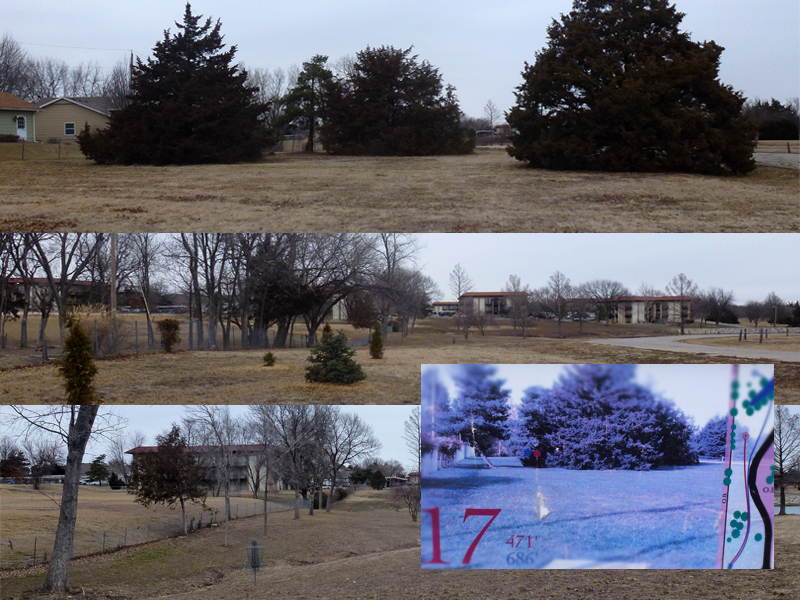 Anyway, I’ve been DYING to tell you guys a little bit about the crazy winter we’ve been having here in Missouri. It’s been a winter wonderland. Not “wonderland” like the deep snow and beautiful trees on a Christmas card—we’re not quite northern enough for that. I mean WONDERland, like “I wonder if it’s going to be 60 and sunny, or if it’s going to be so cold the news anchors are telling me not to let my dog outside for more than 10 minutes.” So, let’s take a look at Missouri’s last few weekends. 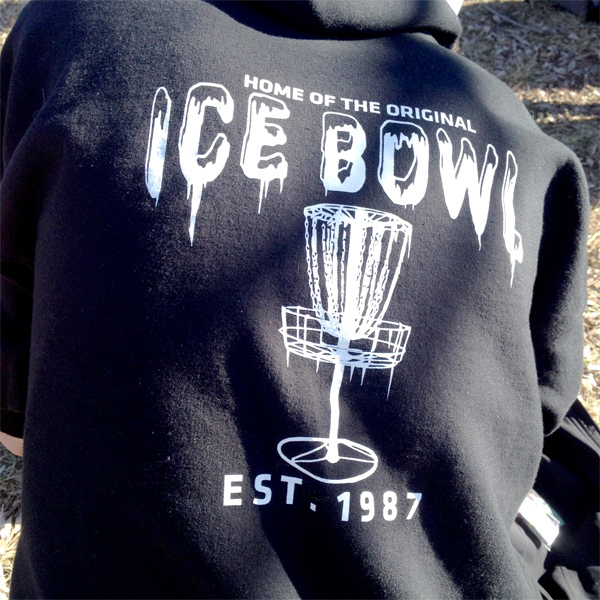 Four weeks ago today I played in the 28th Annual Ice Bowl in Columbia, Mo. 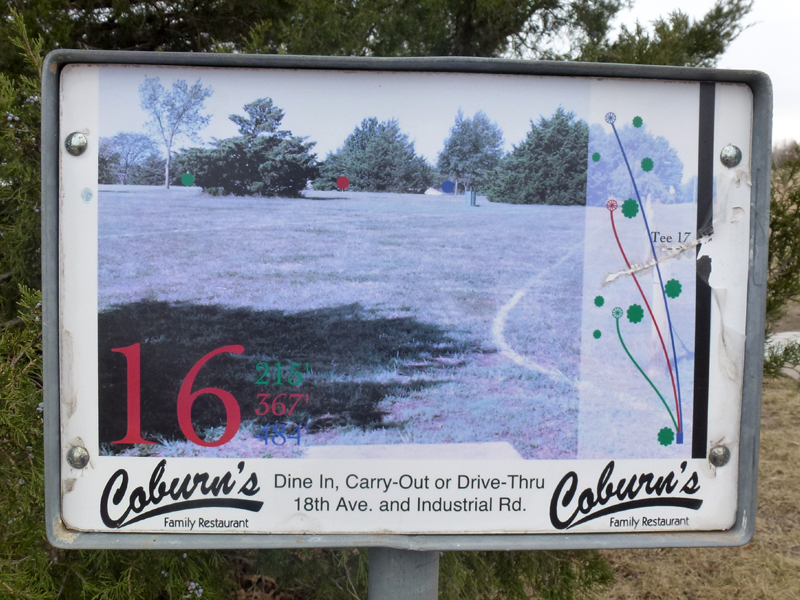 Columbia is not only my hometown, but the home of the original Ice Bowl in 1987. As we all know, the official Ice Bowl slogan is “No Wimps, No Whiners,” and for the 28th Annual there was nothing to complain about. The weather was beautiful, in the 40s and no rain or snow. 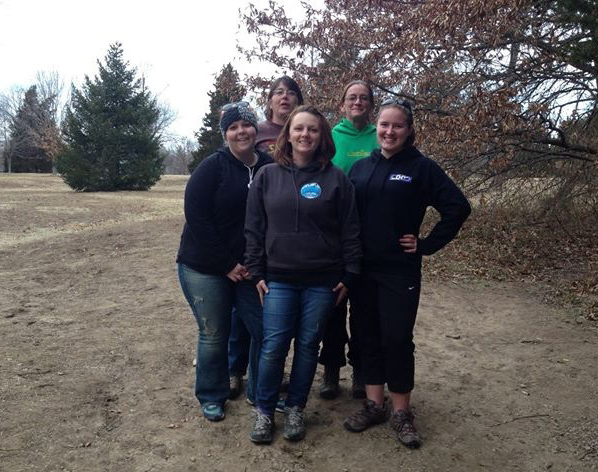 I was very happy to be able to play in a division of 5 women, two of us celebrating one year since our first tournament! On top of that, I shot my personal record on the Oakland Top course with a 2 stroke improvement. It was a wonderful day! After such a great experience at the Columbia Ice Bowl, I was really pumped to play the following weekend in Jefferson City, Mo. 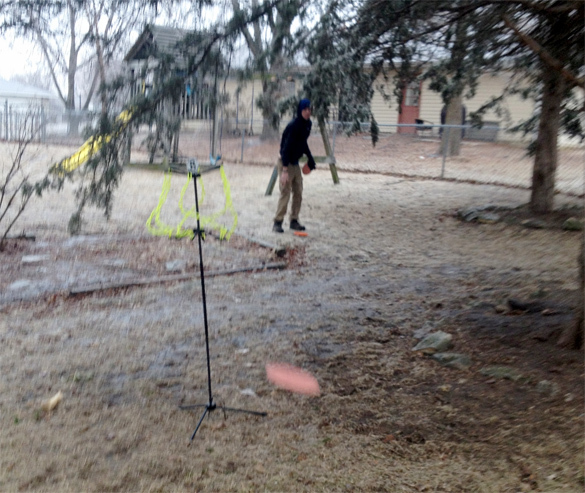 However, the night before the tournament there was an ice storm and it wasn’t safe to make the 30 minute drive. 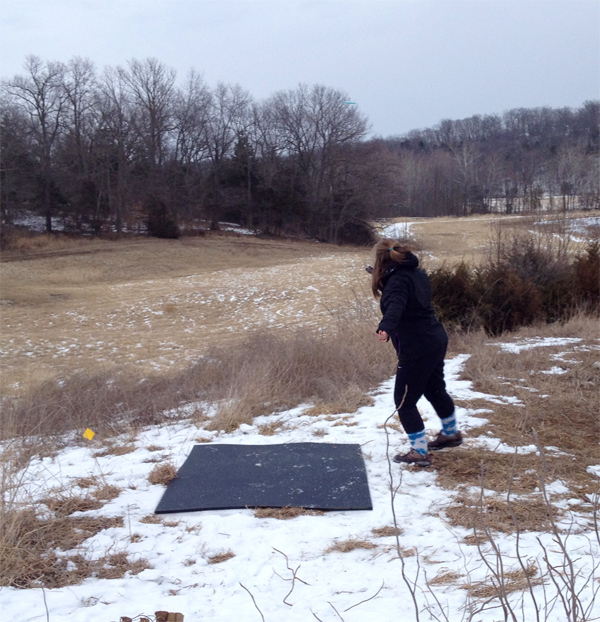 Instead, I spent the day playing a 4-hole NOMAD course at my house and gathering with my neighbors to scrape ice off of my street. Not so wonderful. 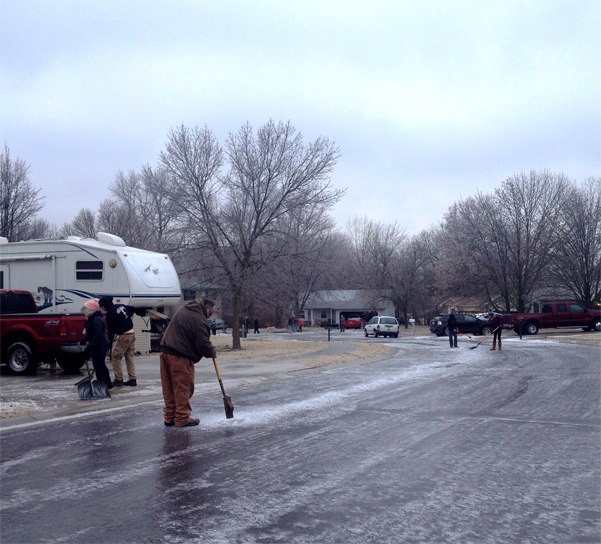 My street covered in ice, and everyone trying to get it cleared off. Although it only snowed a little while I was there, there was plenty of “leftover” snow on the ground, cause it hadn’t been above freezing in at least a week. 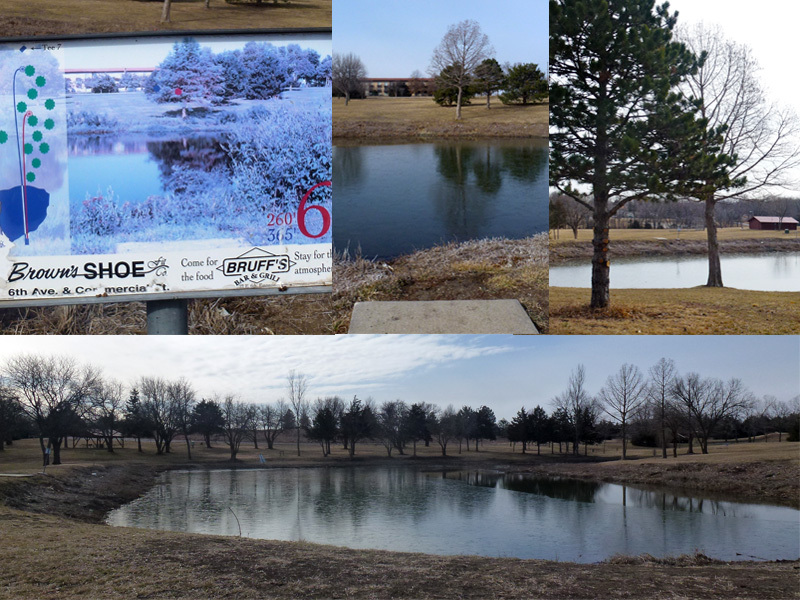 The park’s namesake Binder Lake was frozen enough to walk on (although I never recommend walking on ice! ), which is pretty rare. During this round my winter weakness was particularly evident. I’m usually pretty good at not letting cold affect my mental game, keeping my throwing hand warm, and not letting my feet get wet. 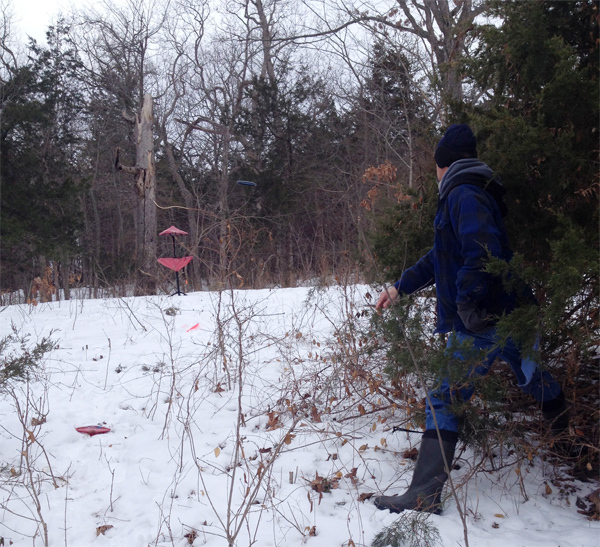 But the worst thing about winter disc golf is wearing so many layers that it limits my range of motion. For the most part it doesn’t impact my driving, but trying to follow through on a putt when I feel like the Michelin Man is just not going to happen. 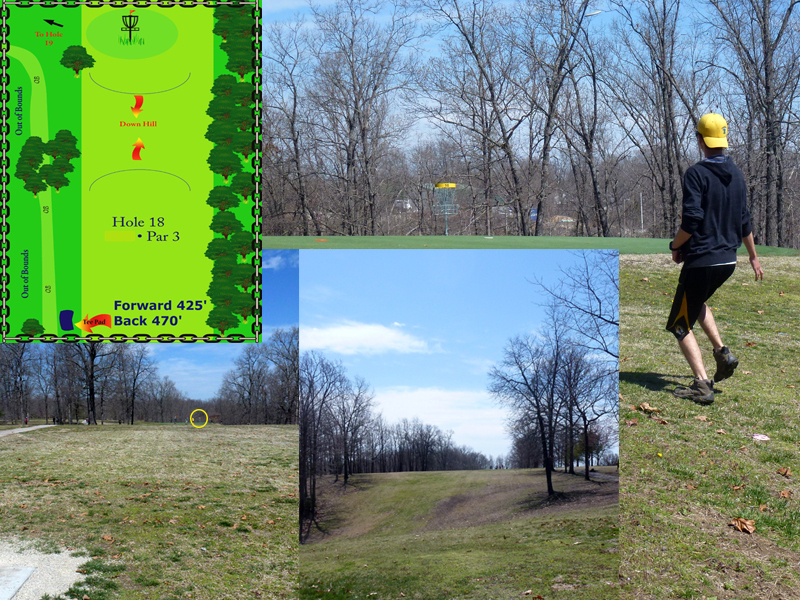 Just six days later, I played my first short-sleeved round of the year at Carrollton Park in St. Louis. It was a beautiful, sunny day reaching a high of nearly 60 degrees. Can you say complete weather 180!? 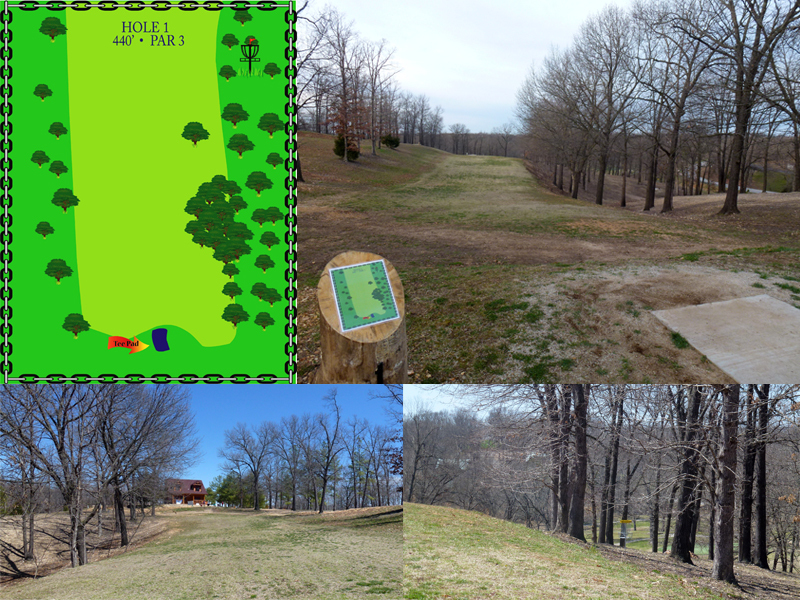 Then, fast forward to today, when the high is expected to be only 38 degrees; my disc golf feat for the day will only consist of writing this post and wishing I were at the Gentlemen’s Club Challenge, where it is currently 65 and sunny! 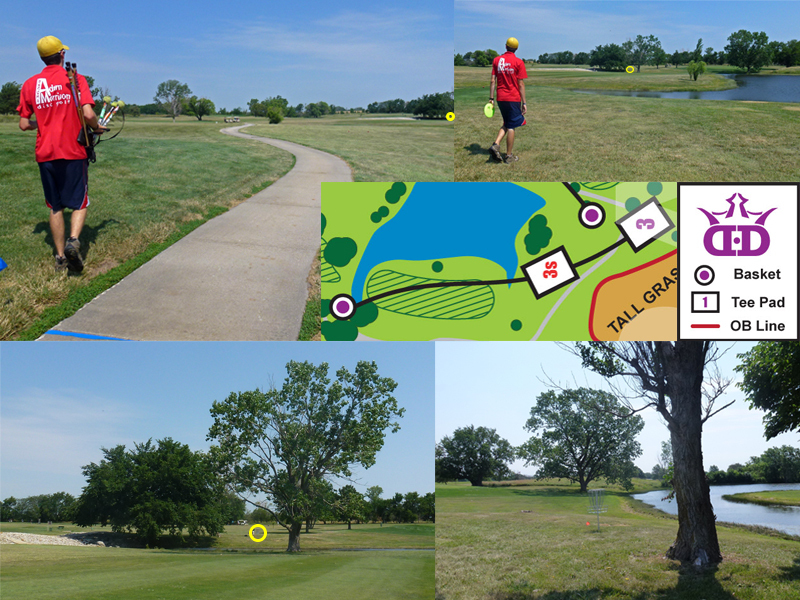 I’ve had the pleasure of walking the Municipal Golf Course’s temporary disc golf course three times this year, although I have not yet had the chance to get out there without the purpose of caddying! 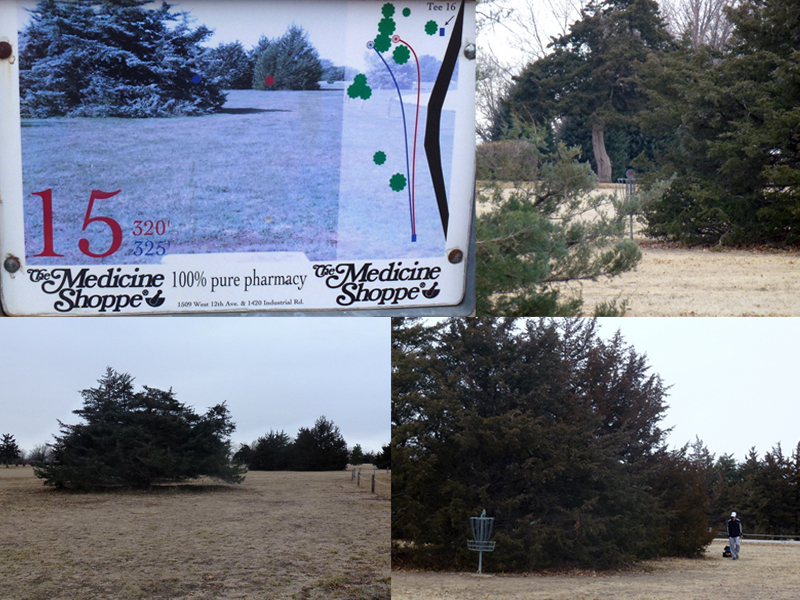 Municipal, located just outside of Emporia, KS, uses only half of the ball golf course, and plays a total distance of 8,608 ft for the long tees and 7,987 ft for the short tees. Course par is 65. 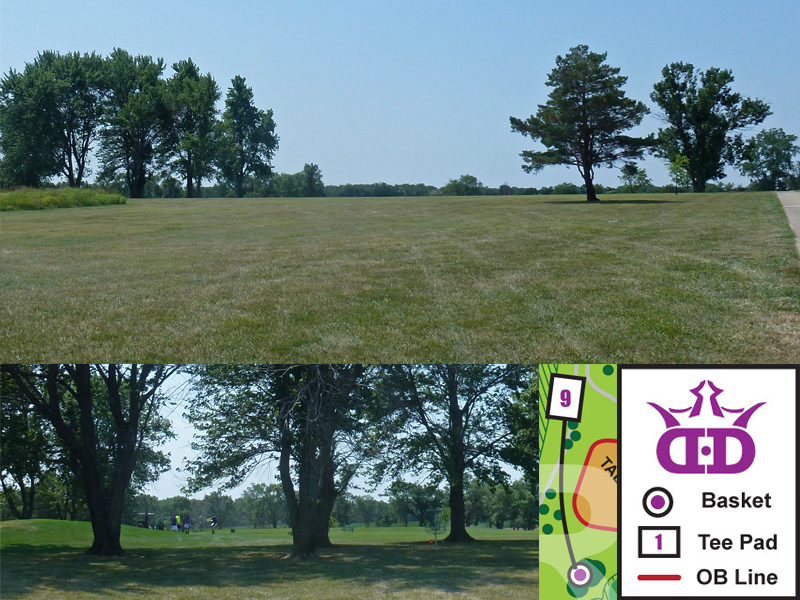 Throughout the week, this course will be used for the PDGA Amateur World Championships. The A and B pools of Advanced Men played it today, with a hot round of 55. 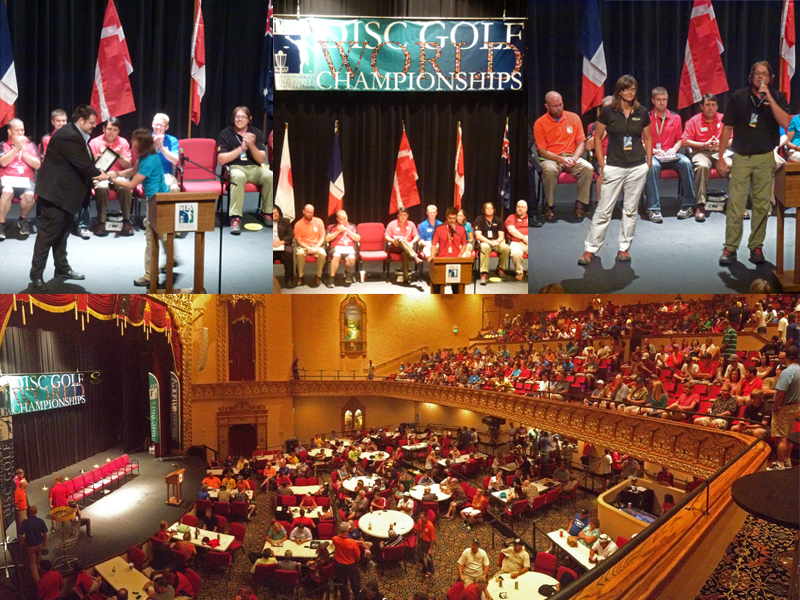 Tomorrow the C pool of Advanced Men and Advanced Grandmasters will play the course. The Advanced Men will play it once more on Thursday or Friday. Because I have not personally played this course and because I’m trying to spend as much time out experiencing Worlds while I’m here, I’m going to let the pictures speak for themselves (they are worth a thousand words, right?). 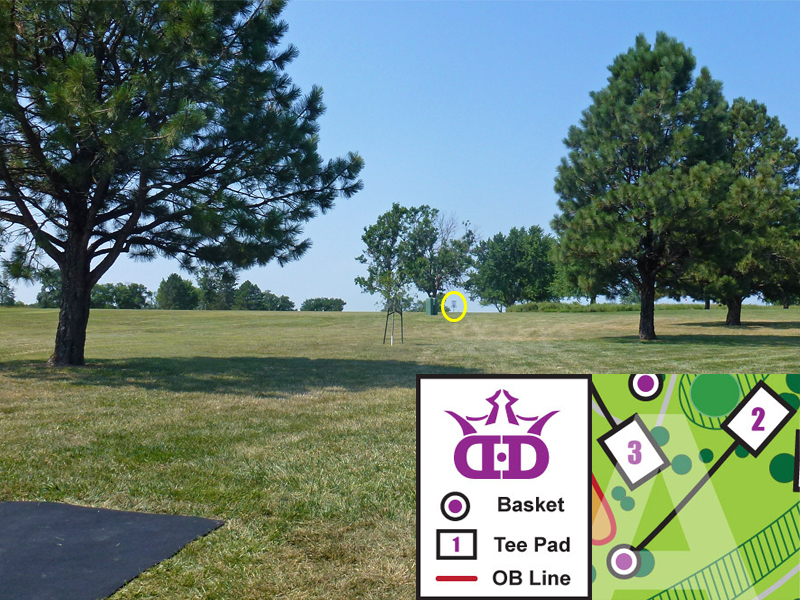 For an overall course map and hole-by-hole distance and OB information, head over to the Dynamic Discs website: http://www.dynamicdiscs.com/2013amworlds/courses/. 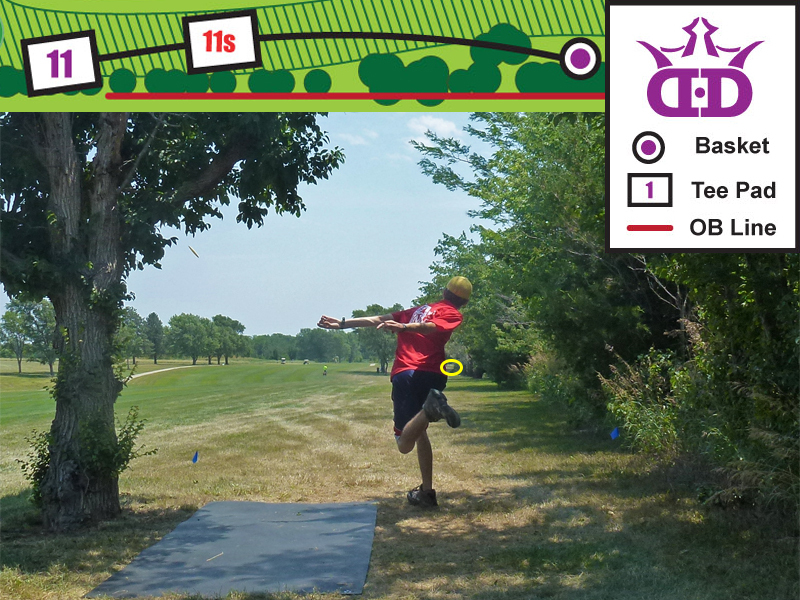 Dynamic Discs has been very supportive of my efforts to keep you all updated on the Amateur and Junior World Championships by allowing me to use bits and pieces of their course map here on Dogleg. Thanks for being so great! And now, to the course! Hey Dogleggers! 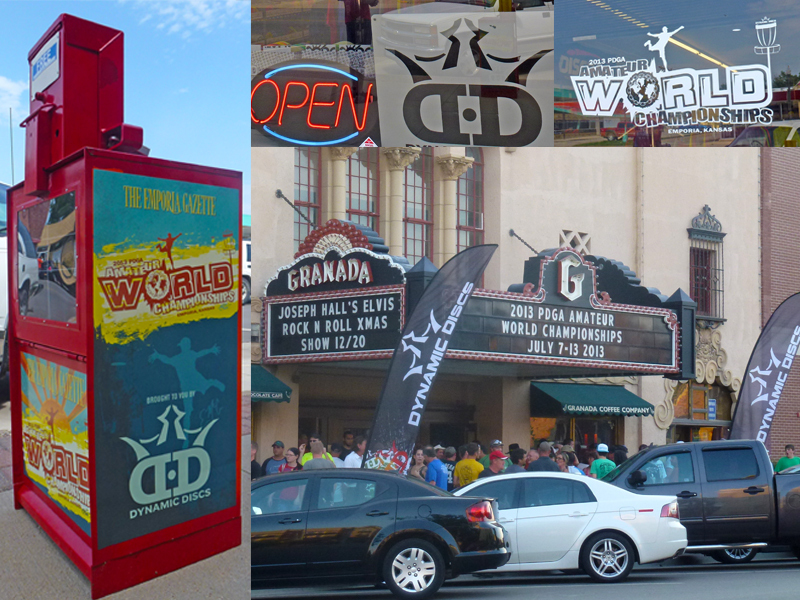 I’m very excited to have the opportunity to spend this week at the 2013 Amateur and Junior World Championships in Emporia, KS! 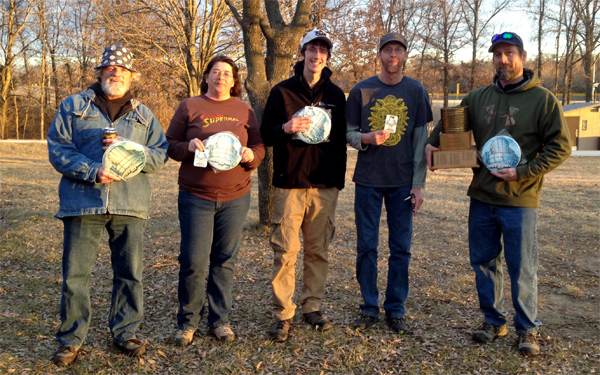 This small town is booming with disc golfers, with more than 540 competitors here. During my time here, I plan on bringing you daily updates on all things worlds. Tomorrow [Tuesday] I plan on posting a course guide of the Municipal Golf Course, where the Advanced Men division will be playing in the morning. Other than that, I’d be happy to take requests on what you’d like to read. Just let me know in the comments, or tweet me @MLeeFry. 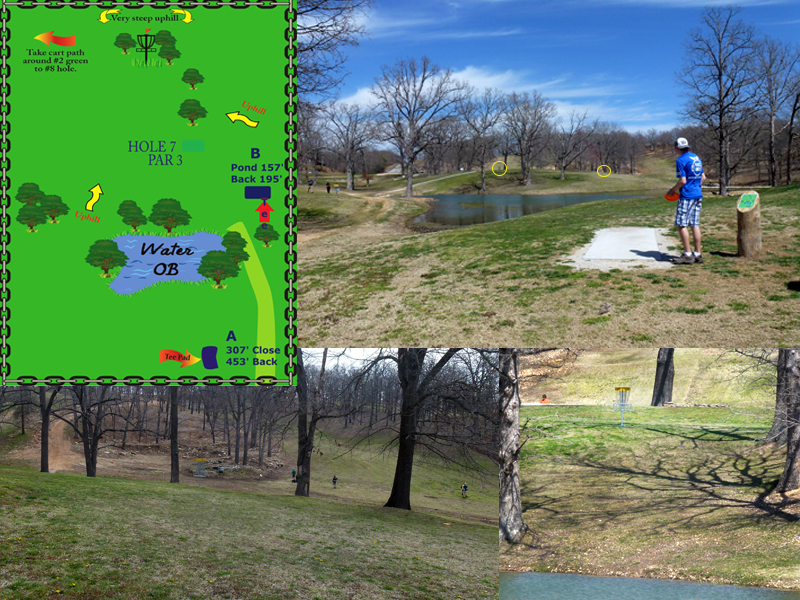 Since driving in from Columbia on Saturday, I’ve been to 4/5 of the courses, hung out at the field events, attended the players meeting, and socialized in our campground (which is PACKED with disc golfers!). 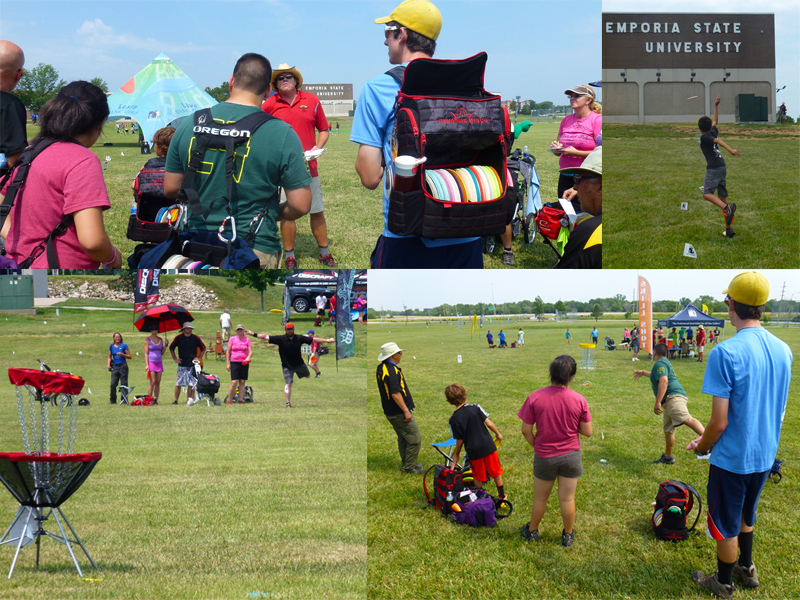 The photo collages below make up just a small portion of what’s going on here in Emporia, and I look forward to updating you on more throughout the week! 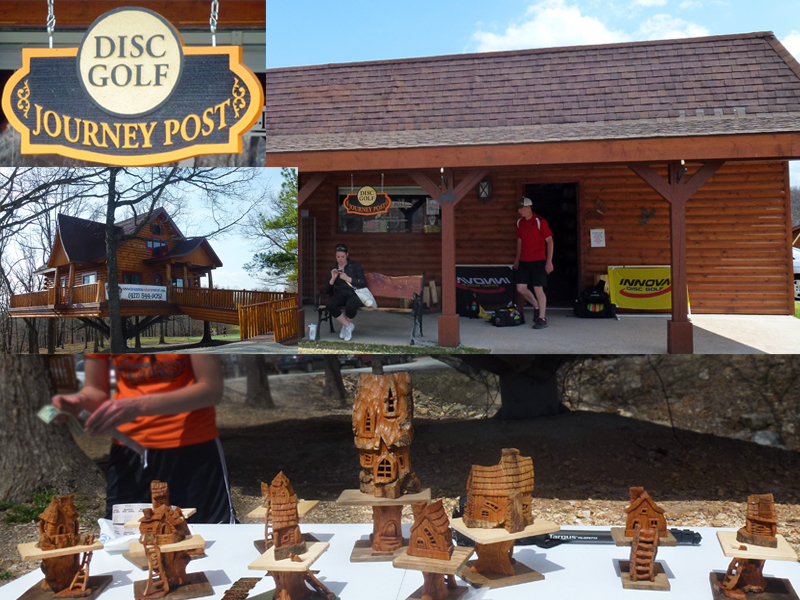 Some of the houses at Treehouz, including a treehouse, the Journey Post, and the trophies for Journey Post’s First Stop. 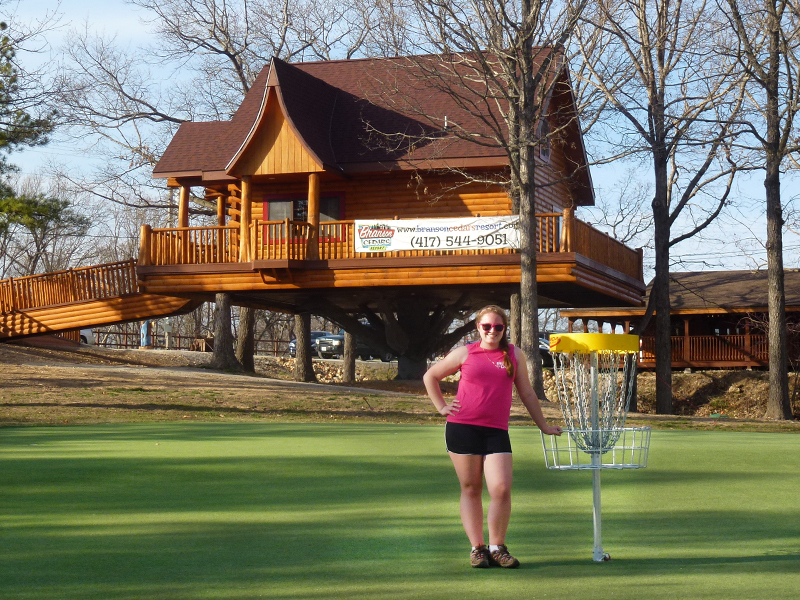 About three weeks ago I made my first visit to Branson Cedars Resort, home of Treehouz Disc Golf Course and The Journey Post. 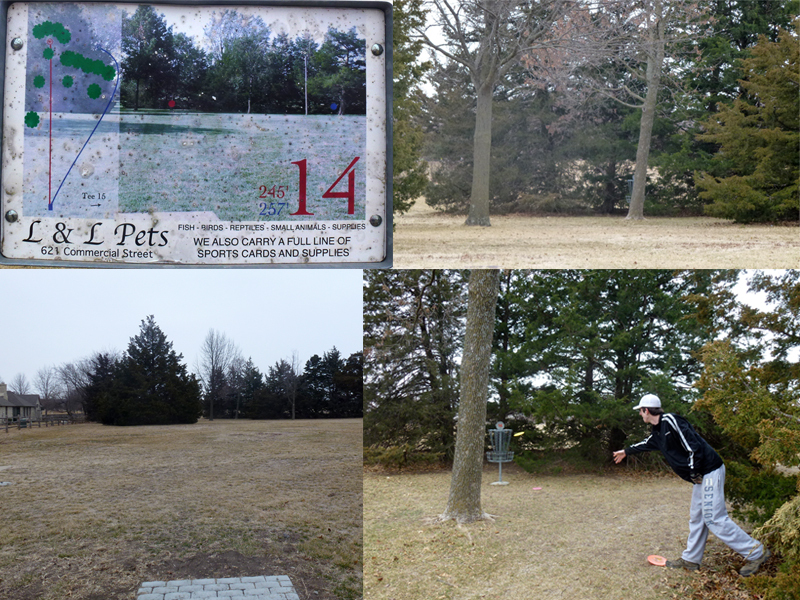 The occasion was Journey Post’s First Stop Presented by Prodigy Discs. 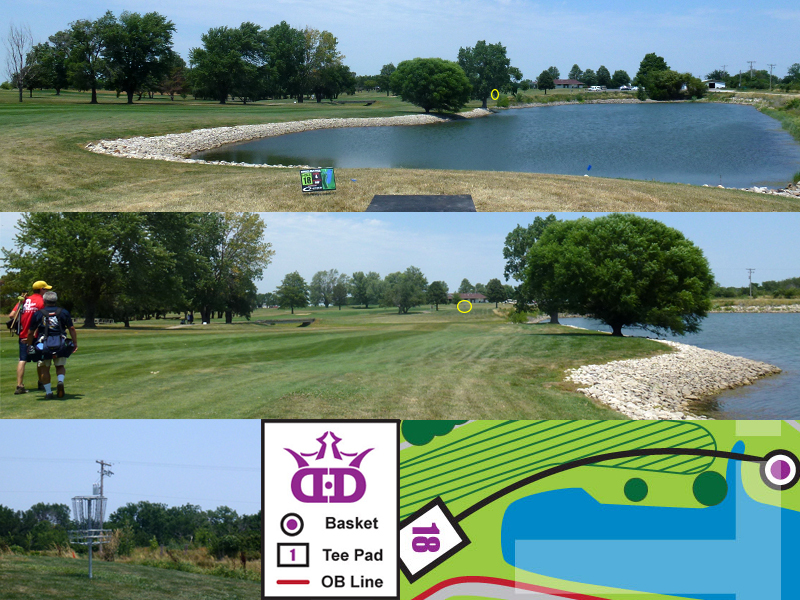 I chose not to play in the tournament for a few reasons, including the difficulty/length of the course, which I think was a good decision at the time. I’ll be ready for it before I know it though! Anyway, since I didn’t get to play very many of the holes myself, my analysis is based mostly on observation of the Advanced division players, specifically my boyfriend Adam Morrison, and our friend Brad Bullerdieck from Columbia. I also had the pleasure of following the Advanced Grandmasters card for a few holes, and of watching the Pros from afar! Will Schusterick putting on Hole 16. Paige Pierce throwing a warm up drive on Hole 18. So, a little background on the course. 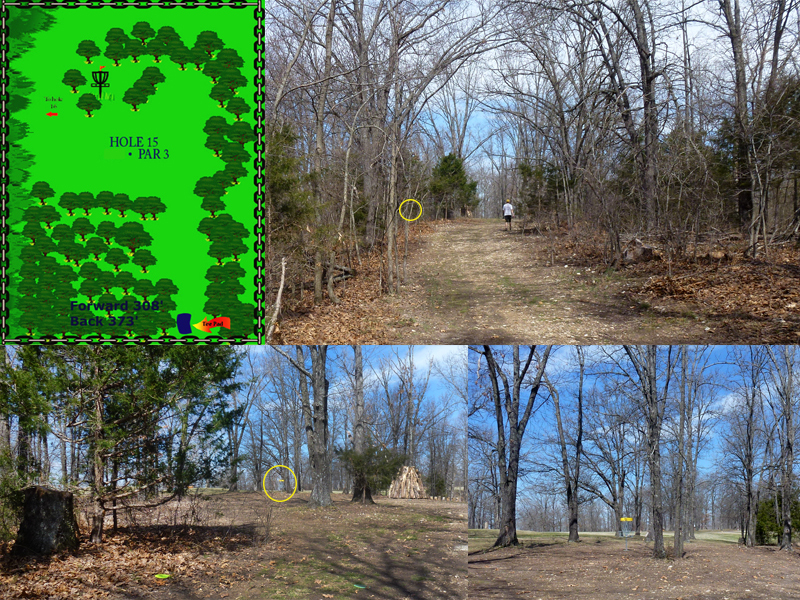 Treehouz is located in Ridgedale, Missouri, between Branson and the border to Arkansas. 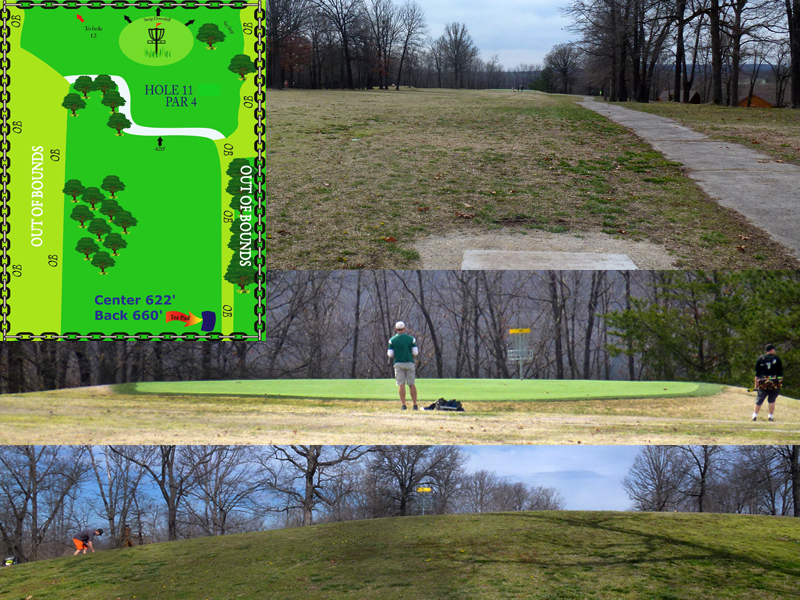 Its 19-hole course’s par is 60, and is a total of 7,407 feet in length. 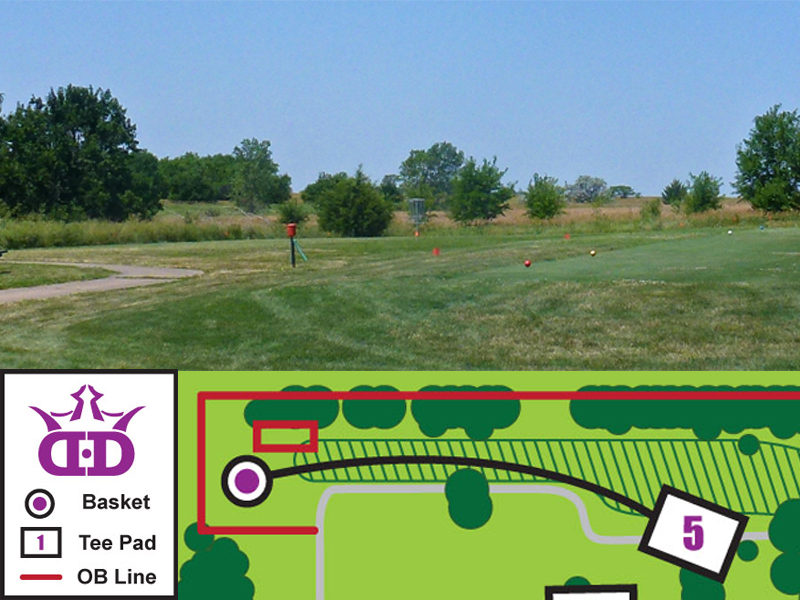 The course uses DISCatcher baskets and has multiple tees and placements on some holes. Treehouz is pay-to-play: $5 per person for a full day. 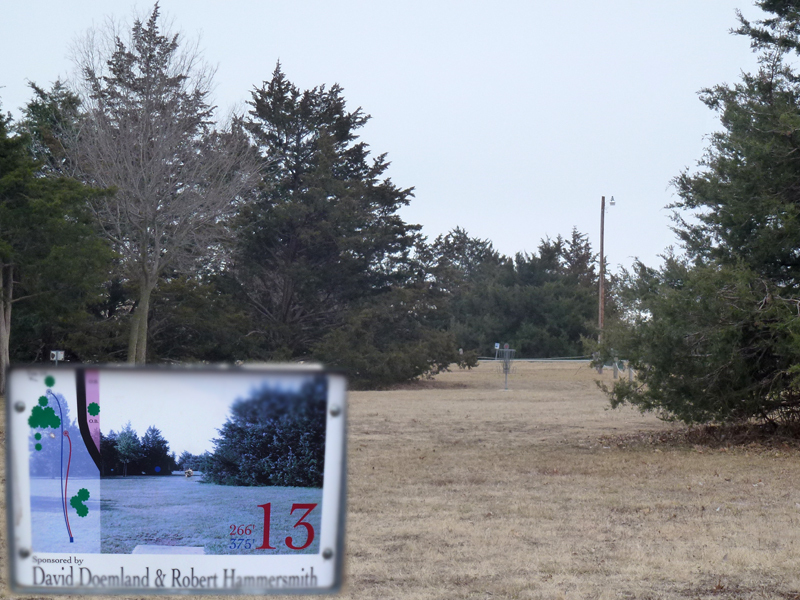 Journey Post owner Jaysin Smith designed Treehouz in 2012. 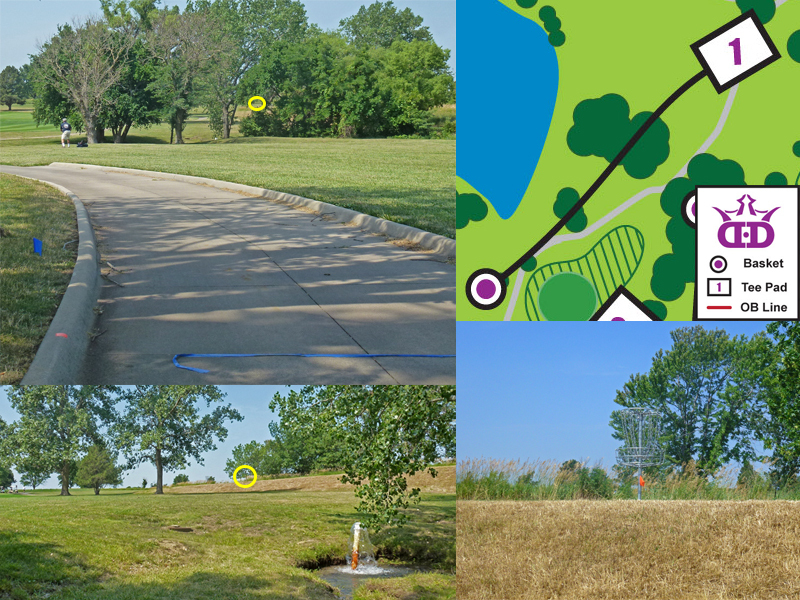 Smith said his vision while designing was to create a, “championship level course with a lot of elevation change and a mixture of wooded holes, open holes, and hazard holes; as well as long and short holes.” When asked what other courses inspired him, he referred to Sioux Passage in St. Louis and Hole 1 on Water Works in Kansas City, in terms of their length and elevation changes. 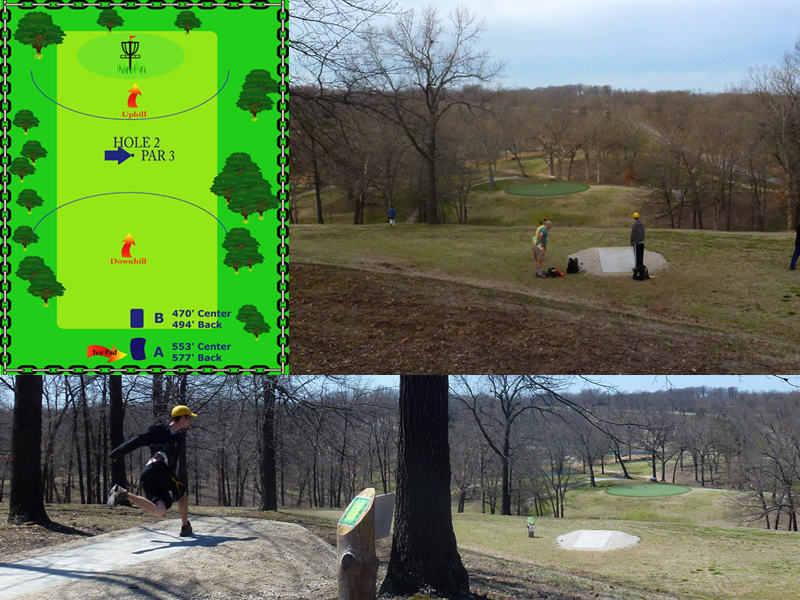 (These courses are particularly iconic for Missourians.) He also wanted to incorporate the difficulty of water hazards as seen at Fountain Hills in Arizona. After seeing this course, I’d say this course definitely lives up to his expectations. As if this isn’t enough, the resort is considering adding more holes, pin placements, and tee pads to make the course larger and more accessible for players of all skill levels. Now that we have the basics out of the way, let’s get to the pictures! 1. 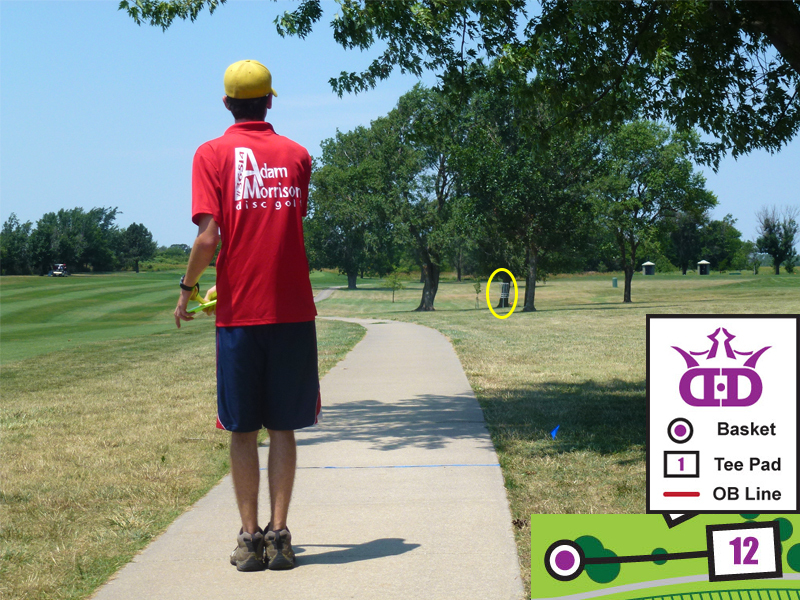 Your disc’s placement in the fairway is critical to playing this hole well. If your disc lands too far to the left, or too short or long, you have to make a difficult upshot down to the basket on slanted ground. If it is too far right, you end up in the woods. 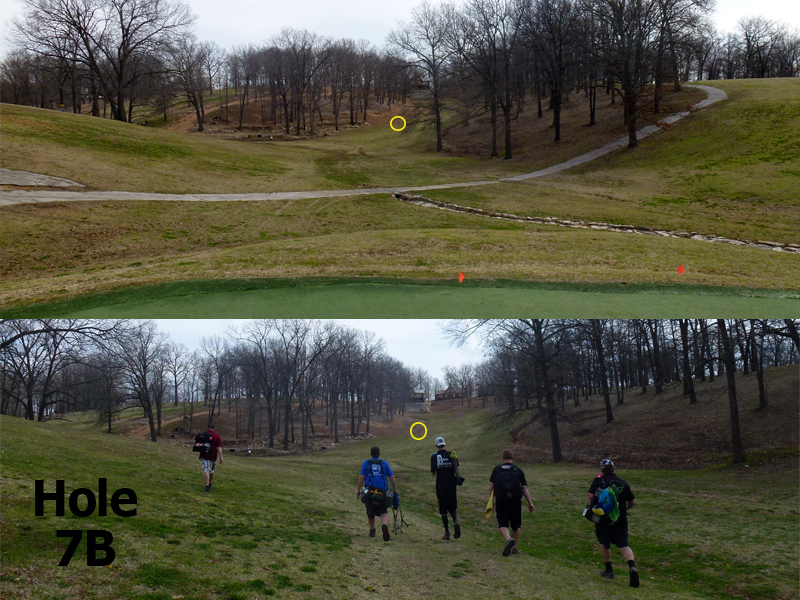 Even worse, I saw a few players land their discs in the fairway, but they ended up rolling into the valley on the right! 2. 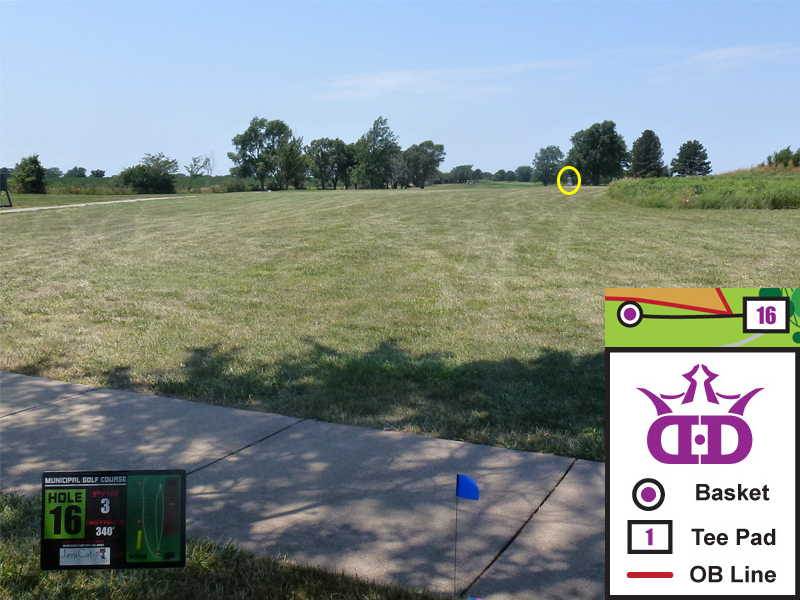 Knowing how your discs behave in the wind and with large elevation changes helps significantly on this hole. It’s challenging from both tees. The view definitely makes it one of the favorite and most iconic holes on the course. 3. 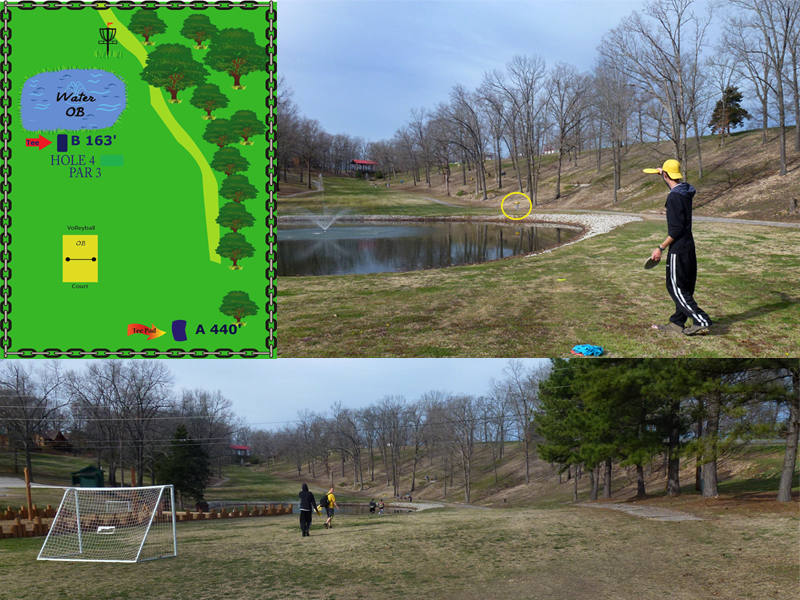 Beware of this hole’s water hazard, sloped terrain, and tree placement. 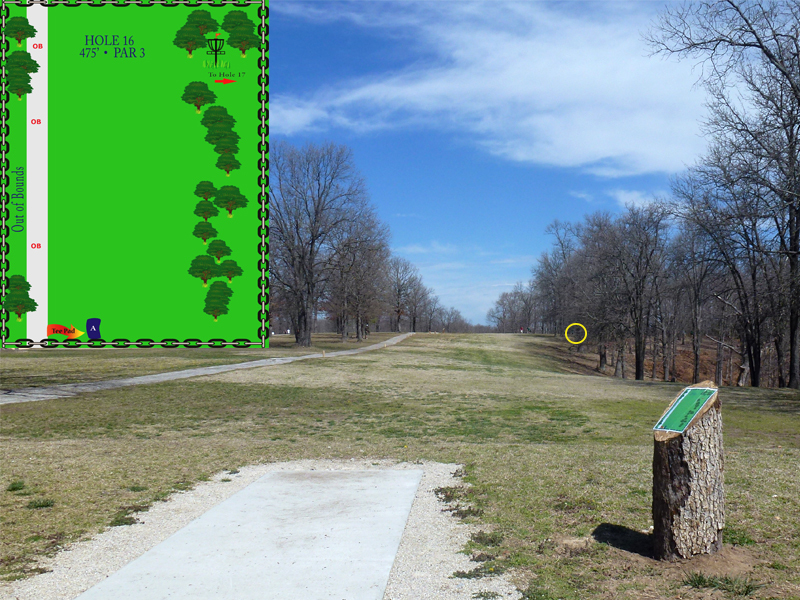 Although this is one of the shorter holes on this course at 337’, it can be deceivingly difficult. 4. This hole is all about placement. With the water hazard so close to the end of the hole, you must decide from the tee where you think you’ll have the most success with an upshot. 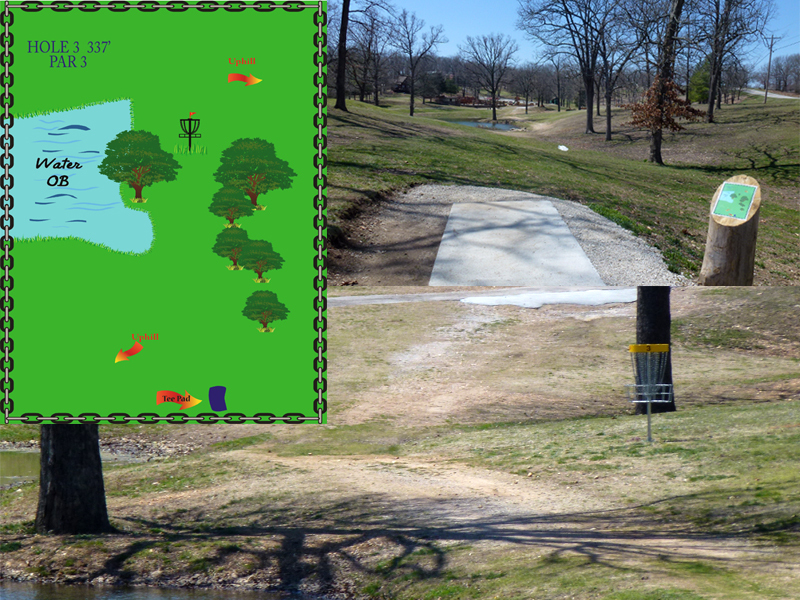 Landing near the water’s edge gives you a straight shot at the basket, but possibly an intimidating putt toward the water. 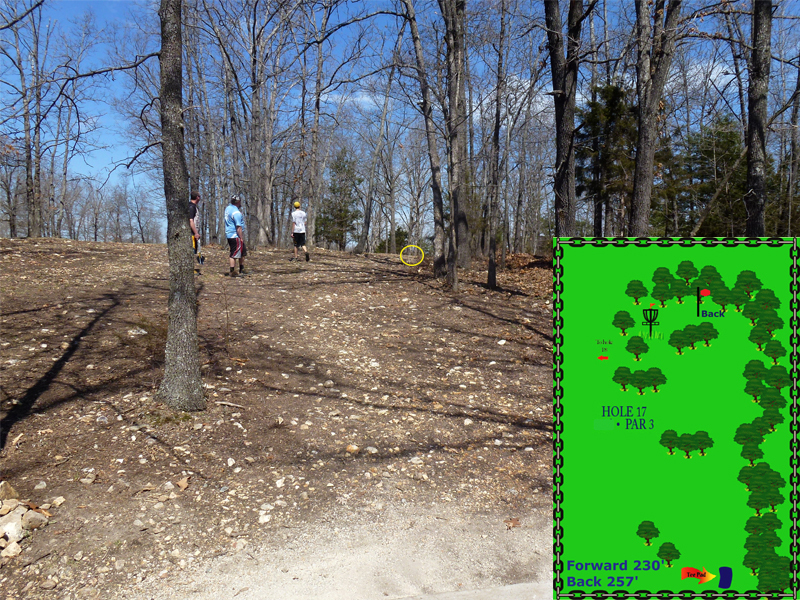 Landing to the right (the path is not OB) is more technical with the trees and the slope, and may lead to a more difficult hyzer upshot because of the possibility of skipping toward the water. However, this positioning will probably allow you to land you closer to the basket and prevent you from putting toward water. 5. You wouldn’t know it from the tee sign alone, but it’s obvious what the challenge is from seeing the terrain of this hole. 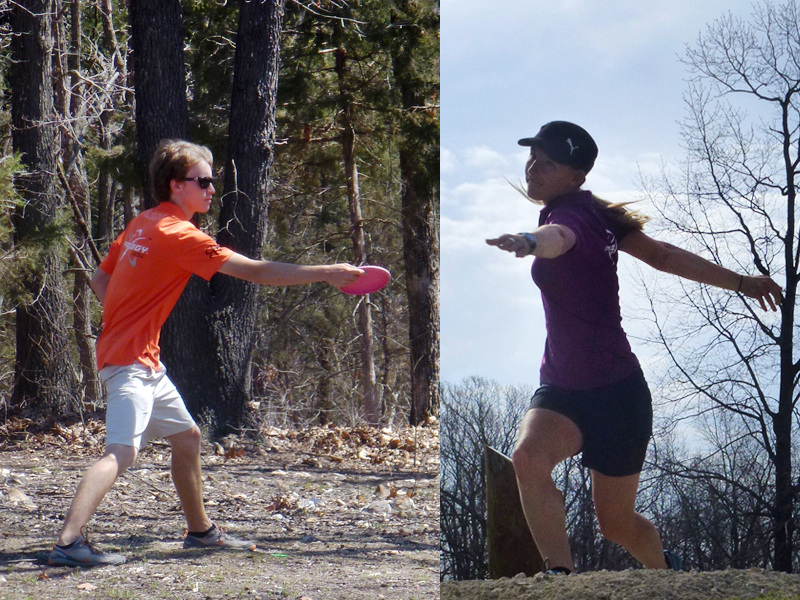 Be sure to know how your disc flies and how it lands—or you’ll be rolling down the hill! 6. 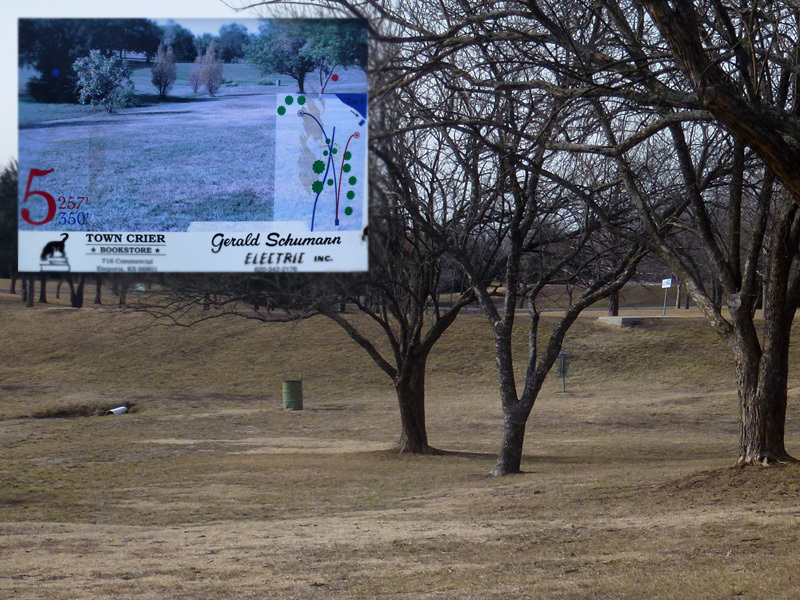 This hole’s hard turn to the left is sharper than it appears from the tee—the sign gives insight into the degree to which your flight path should curve. If you’re too narrow, you’ll hit the trees to the left. If you’re too wide, it may hit the trees and not come back in bounds. 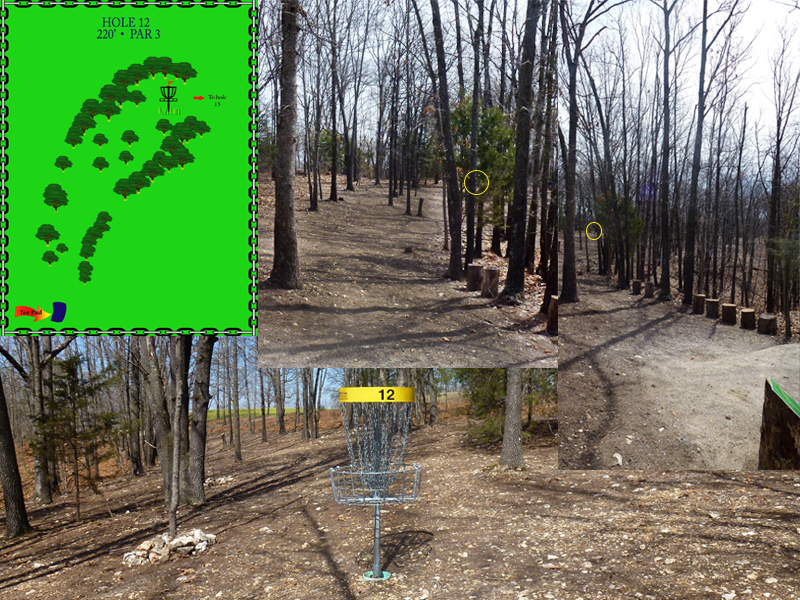 Trees surround the basket, and the green slopes toward the water. 7. This hole combines a water hazard, sloped landing zones, and guardian trees to make it technical. 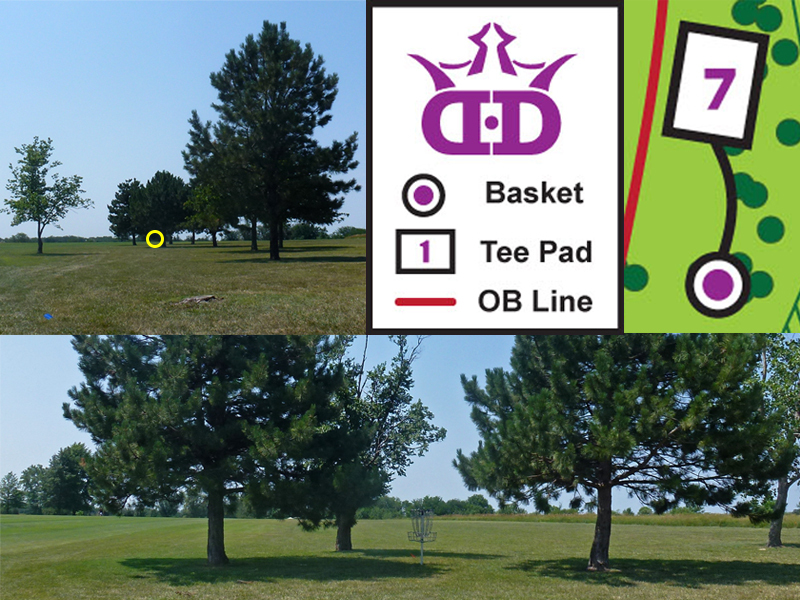 The lower left picture is of the placement designated by the yellow circle on the right and is represented by the basket on the tee sign illustration. 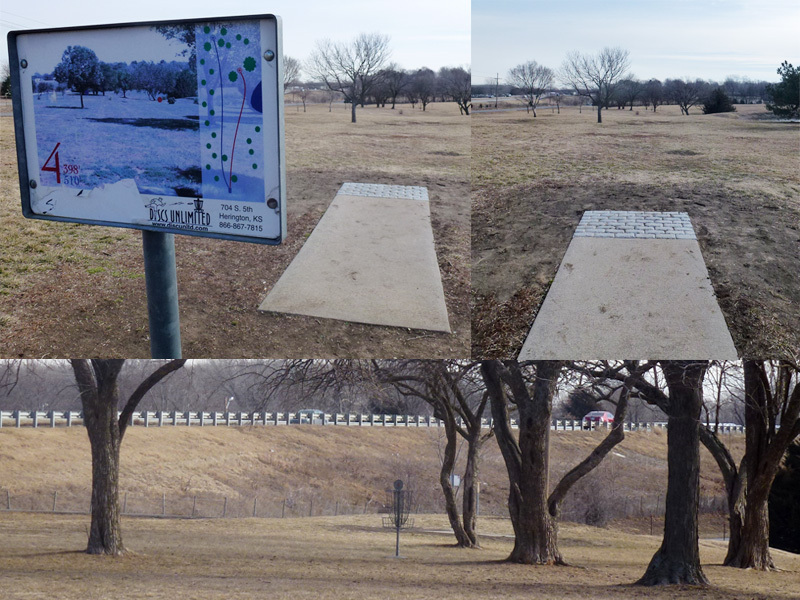 The lower right picture is of the left placement, which is not shown on the sign. 7B. 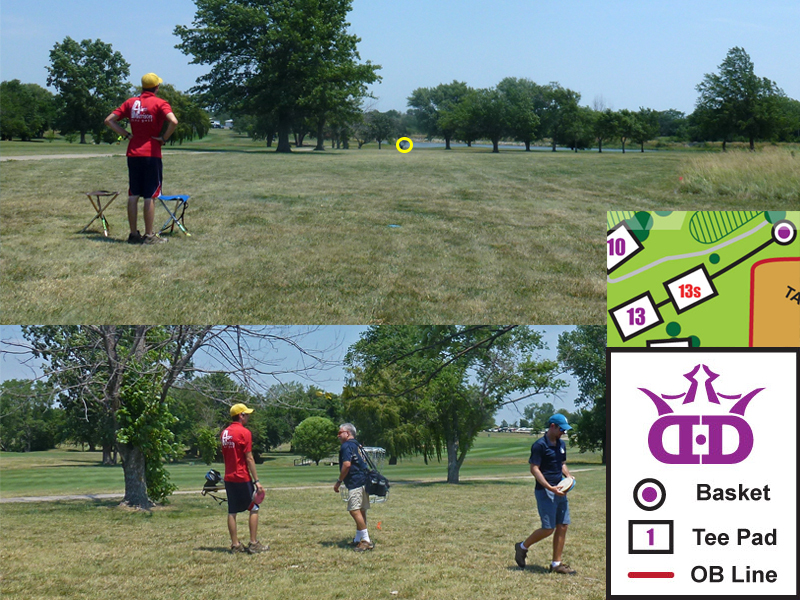 Hole 7B was temporarily used for Journey Post’s First Stop Tournament. Orange flags on the edge of a putting green designated the tee. The fairway curves to the right and slopes upward. Past the curve, trees line the fairway. 8. 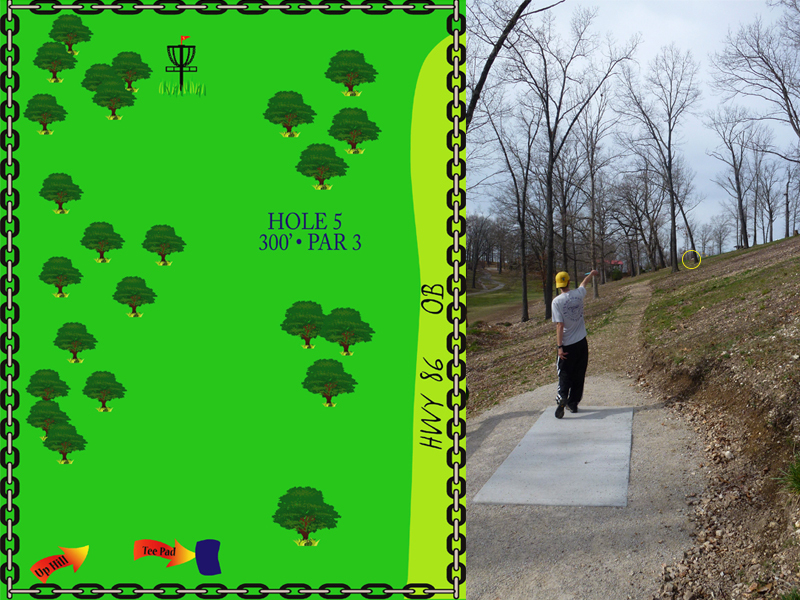 Hole 8 is characterized by its steep uphill fairway and dense trees. I saw several birdies on this hole during the tournament. 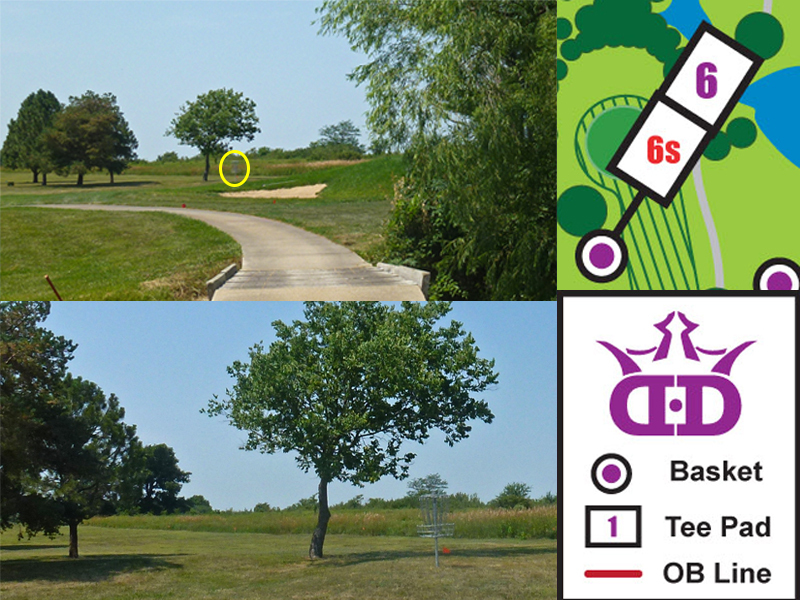 I took a 4 using only a midrange when I snuck this hole in between rounds. 9. 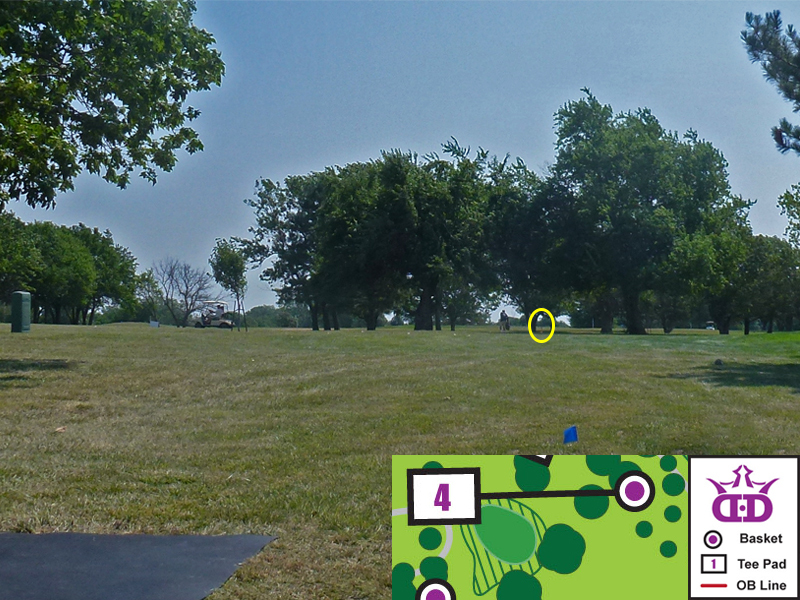 The slope of this fairway in addition to the trees makes the line of your shot very important. When preparing to throw, consider how throwing uphill will affect the stability of your disc, and how your disc will roll when it lands. 10. 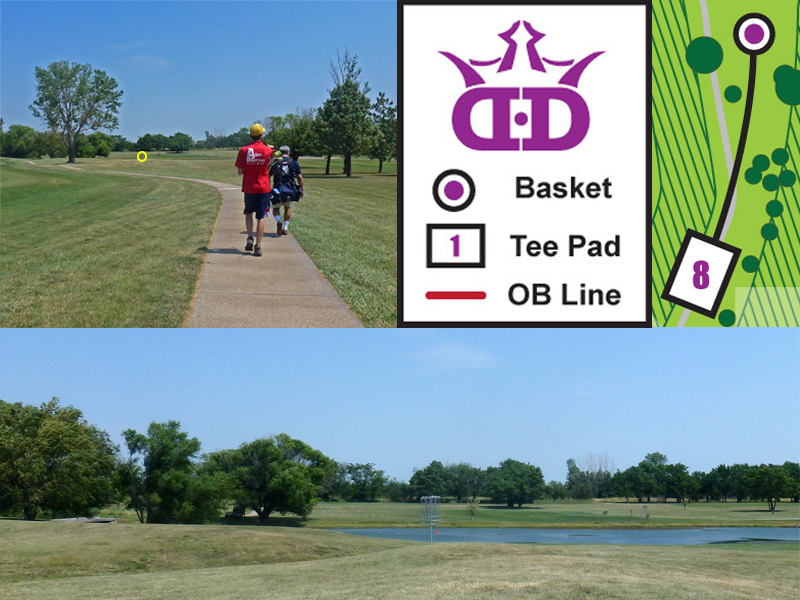 The biggest challenge on this hole is the combination of the OB on both sides of the fairway and the trees that surround the basket. Accuracy in your line is key! 11. 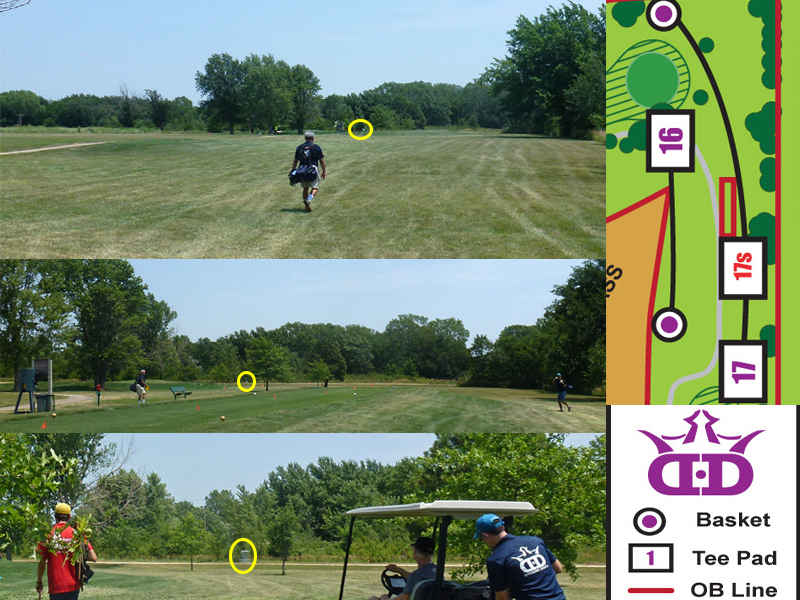 Hole 11 is also characterized by having OB on both sides of the fairway. 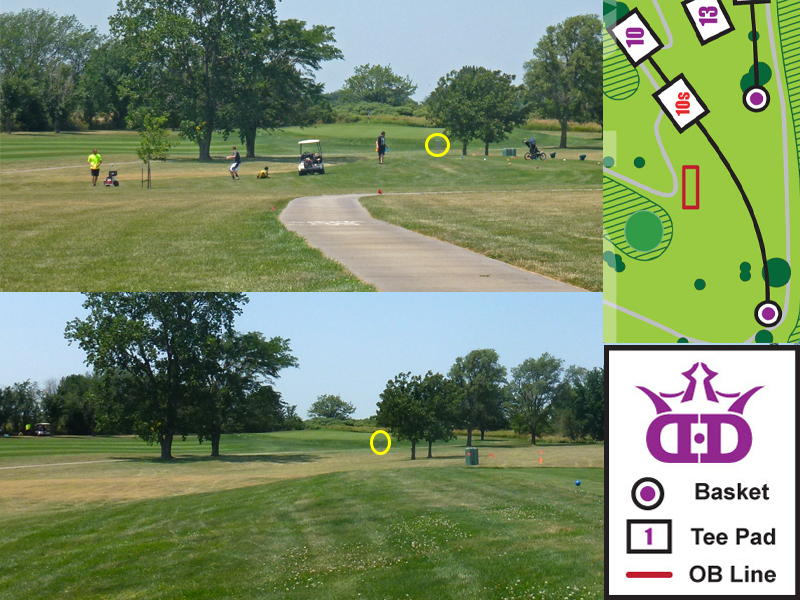 The basket is located on a putting green with a pretty steep hill behind it (the bottom picture is taken from behind). Be sure your upshot doesn’t roll! 12. The gap to hit on this hole is very narrow and makes for a difficult shot (especially for righties). 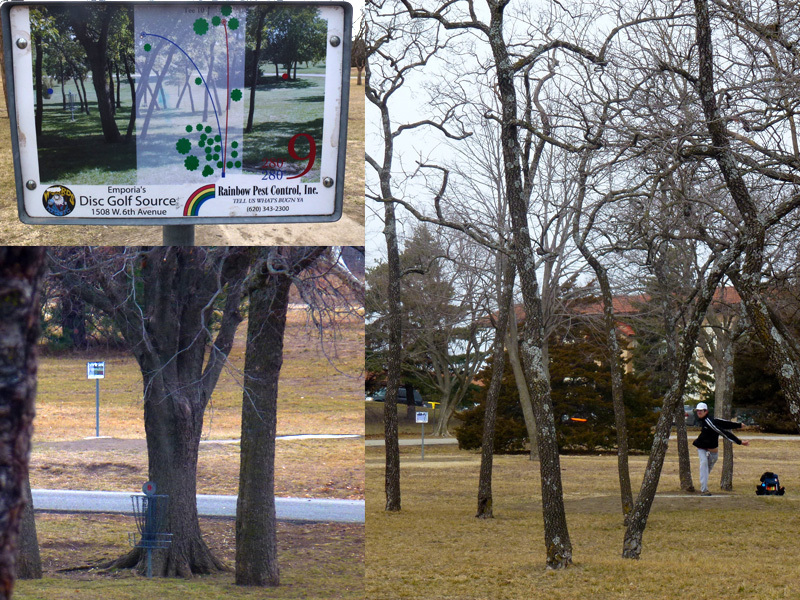 From the tee, the basket is barely visible, as illustrated in the center photo. 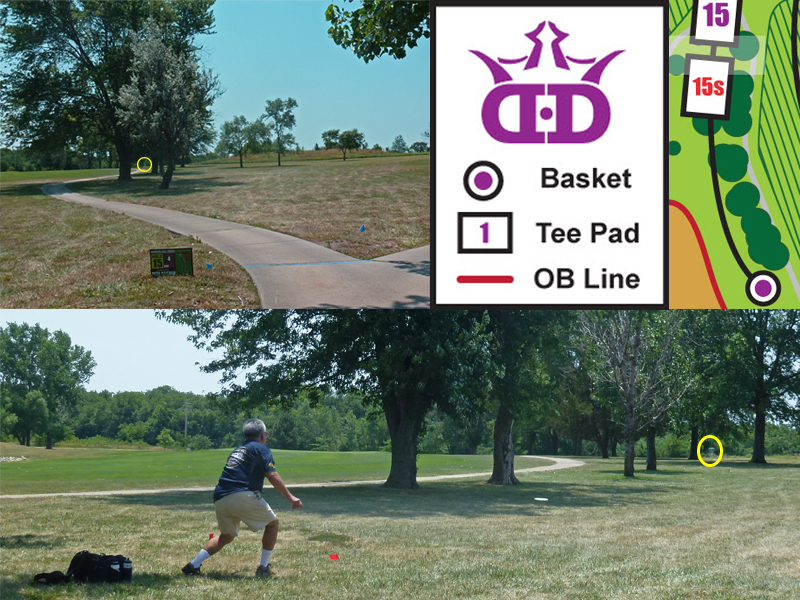 Because you have to step off to the left of the pad, as seen in the far right photo, it can be difficult to judge the angle of the throw. 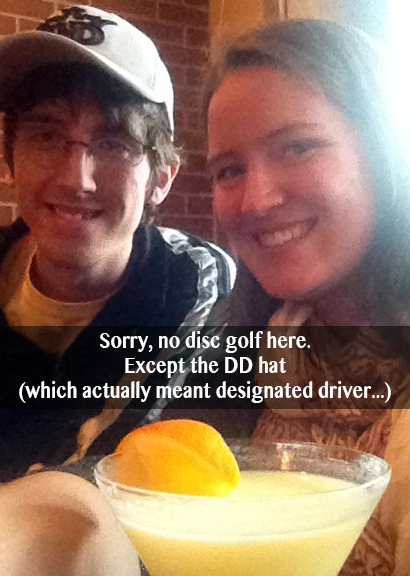 If you’re unlucky enough to hit a tree or an “invisibranch,” you could be in trouble if your disc decides to roll. 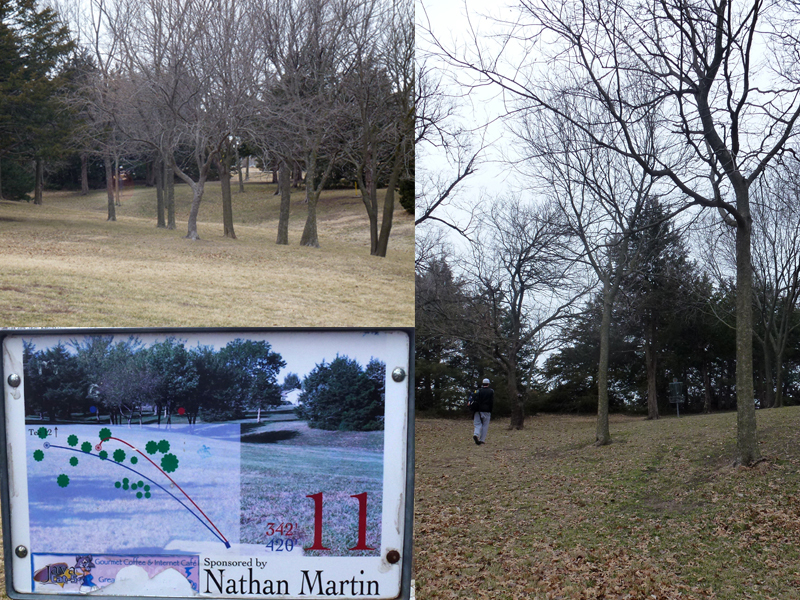 Off to the right of the fairway is a fairly steep hill covered in trees—not a place you want to end up! 13. I think the photo for this hole really says it all. 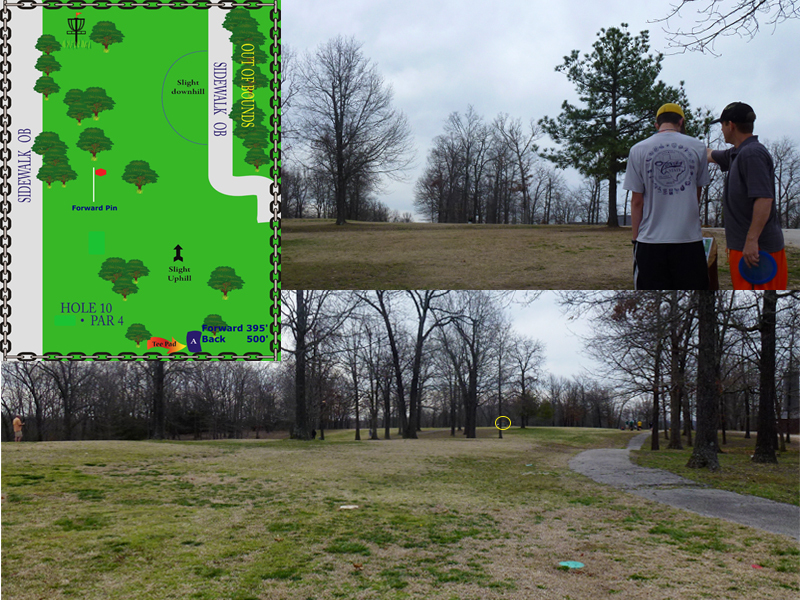 The fairway is pretty narrow with pretty dense trees on both sides and behind the basket. 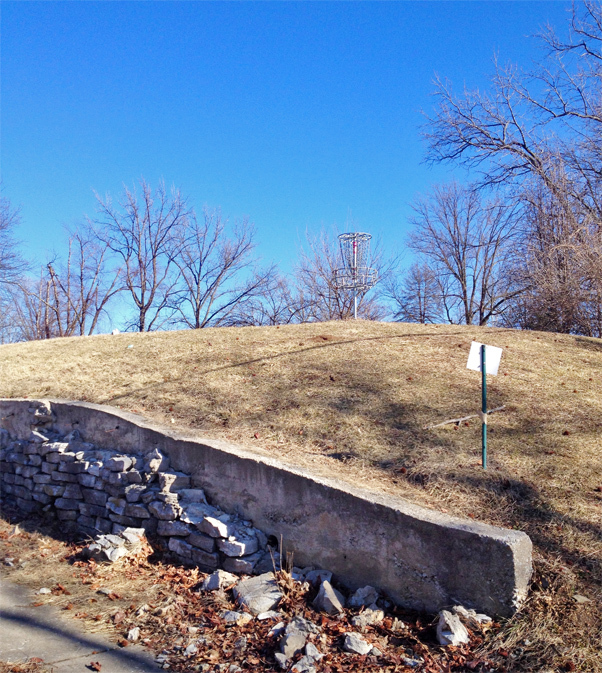 The ground slopes a bit to the right, but not enough to make a significant difference on how this hole plays out. 14. 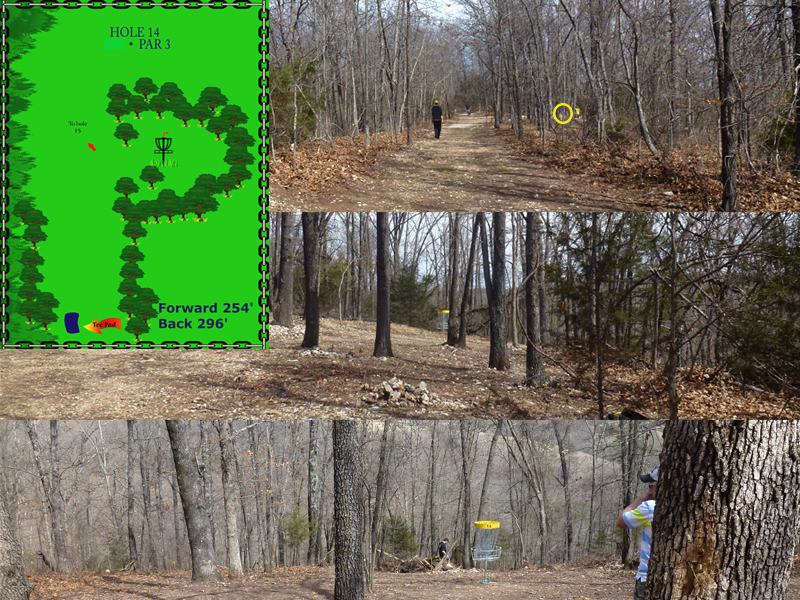 Some call it a fishhook, Adam says it’s a “P” for Prodigy, and I say it’s a question mark for “Where is the basket?” when you’re standing on the tee. From the tee, the fairway looks like a hallway that goes all the way to the tee for hole 15. 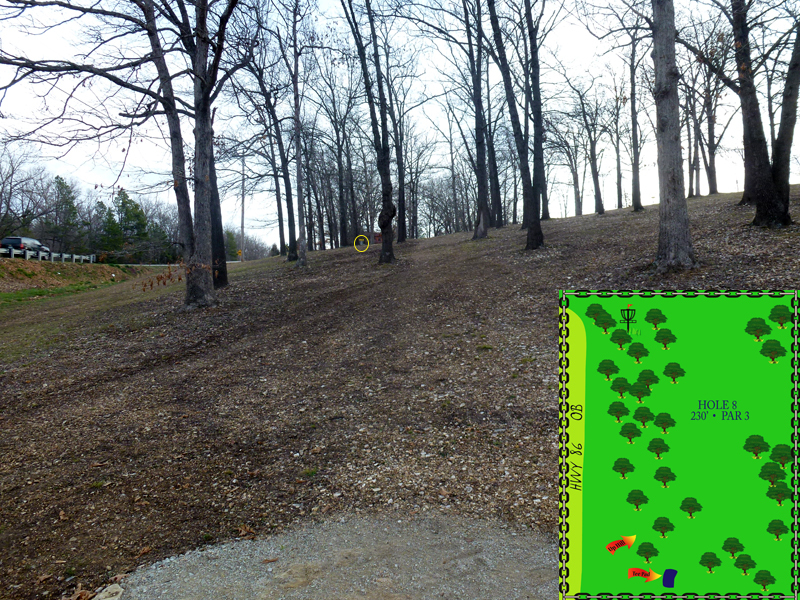 The trees get less dense 200 feet or so down and to the right of the fairway where the basket placement is. 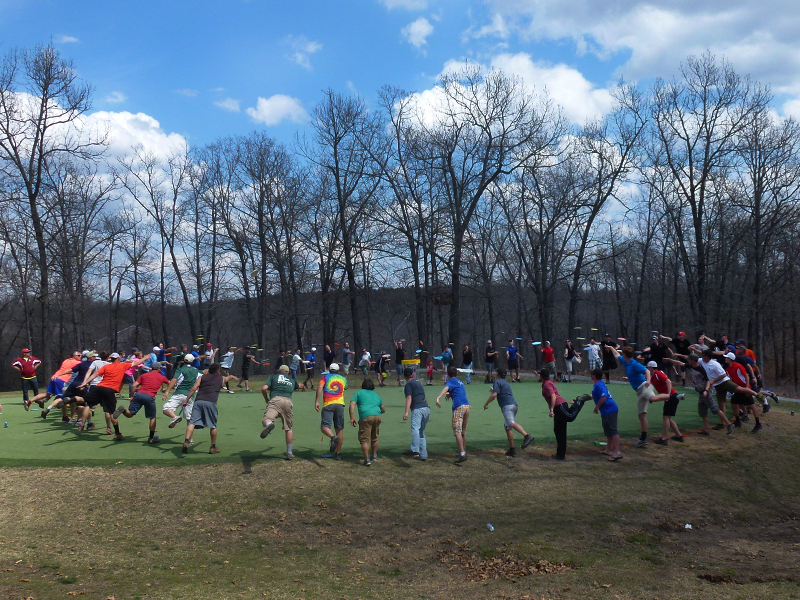 The ground is sloped, so make sure your discs aren’t going to roll! 15. 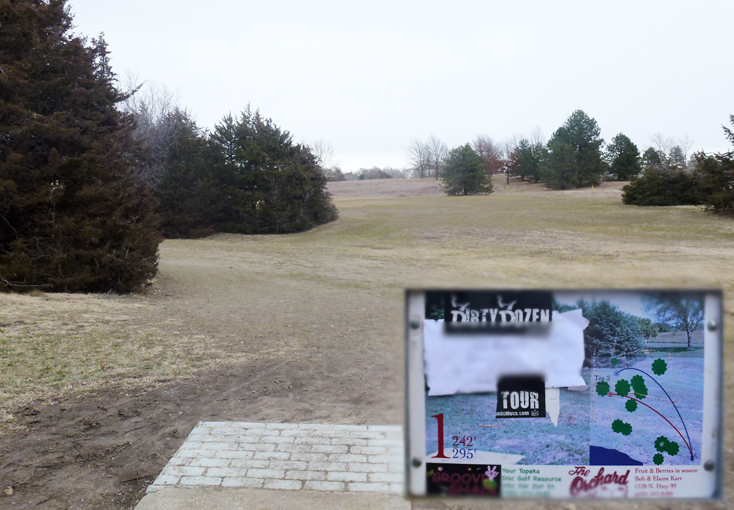 I think the tee sign and the photos of this hole really speak for themselves. I’ll let you figure this one out. 16. 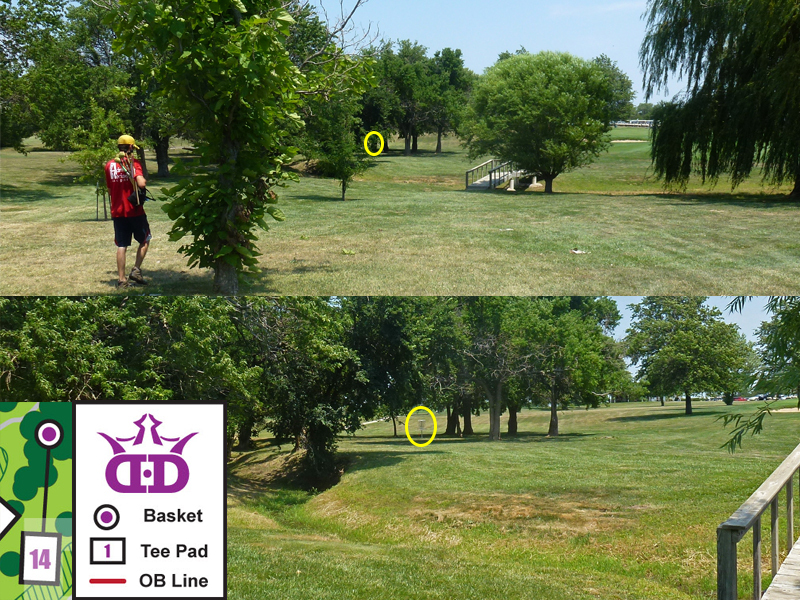 Because of the OB on the left, righties need to be especially aware of the distance, wind, and the line you’re throwing your disc on. Knowing that your disc is prone to rolling on this smooth terrain may impact your disc selection! 17. This tight shot is especially technical because the fairway is uphill. This means your disc is going to be more stable. 18. 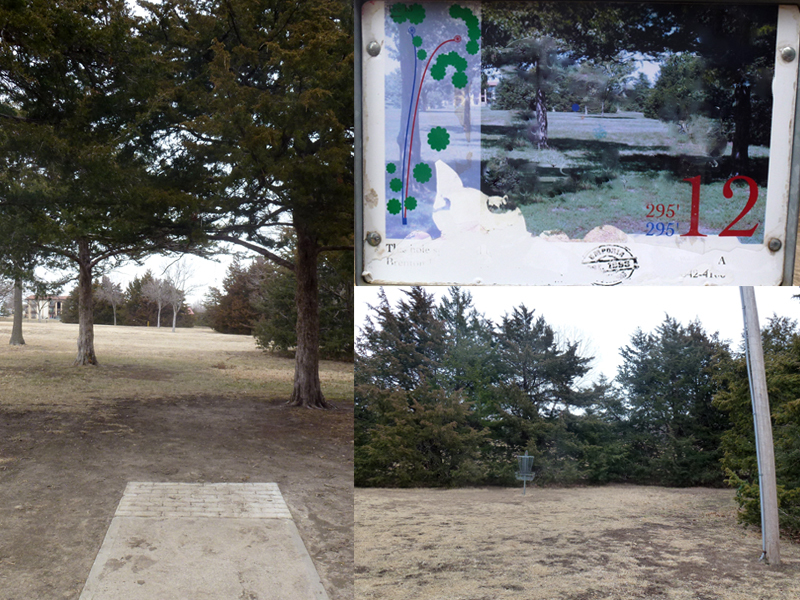 In most cases, the OB should not make much of a difference on this hole if your disc goes where you intend. If you have the arm for it, you’ll want to make sure you get across the valley in the fairway. The closer you are, the more level you’ll be with the basket. 19. 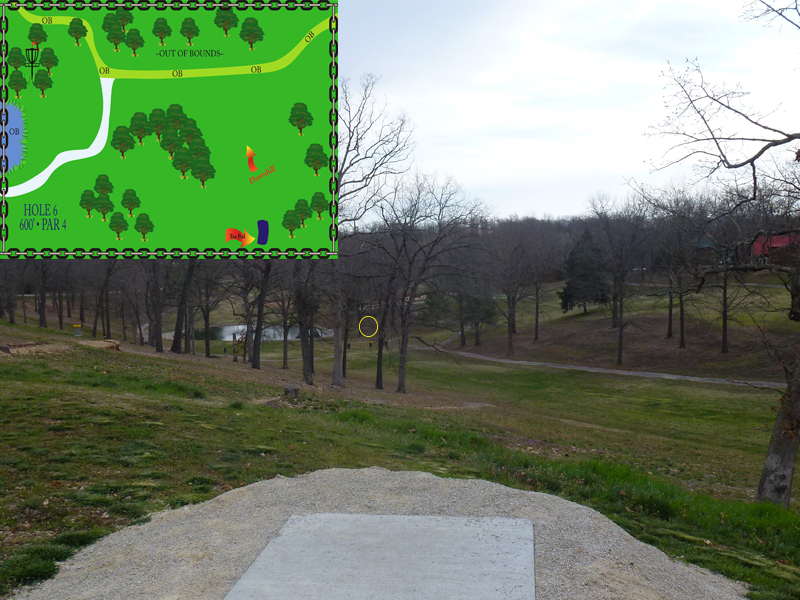 My advice for this hole is similar to hole 18. 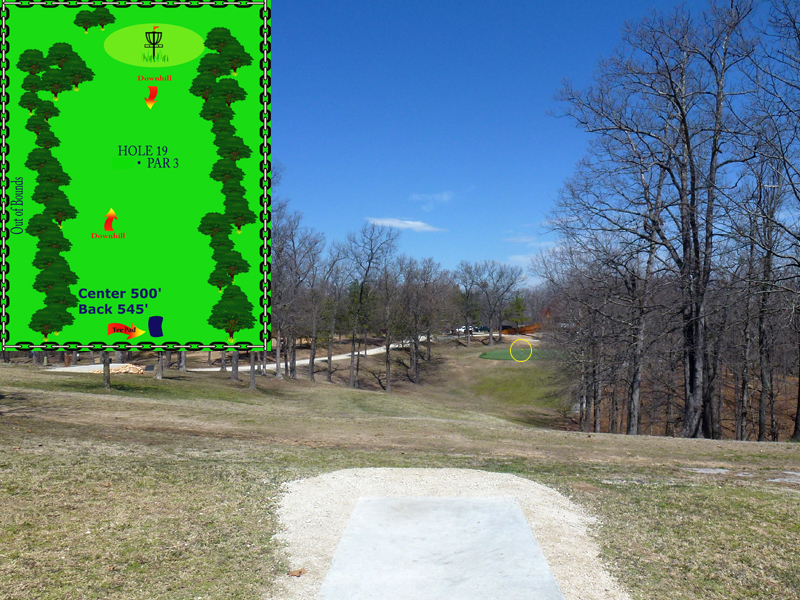 I would recommend trying these two holes as well as hole 2 out before playing them competitively just to get a feel for how the elevation changes effect how far you are able to throw. 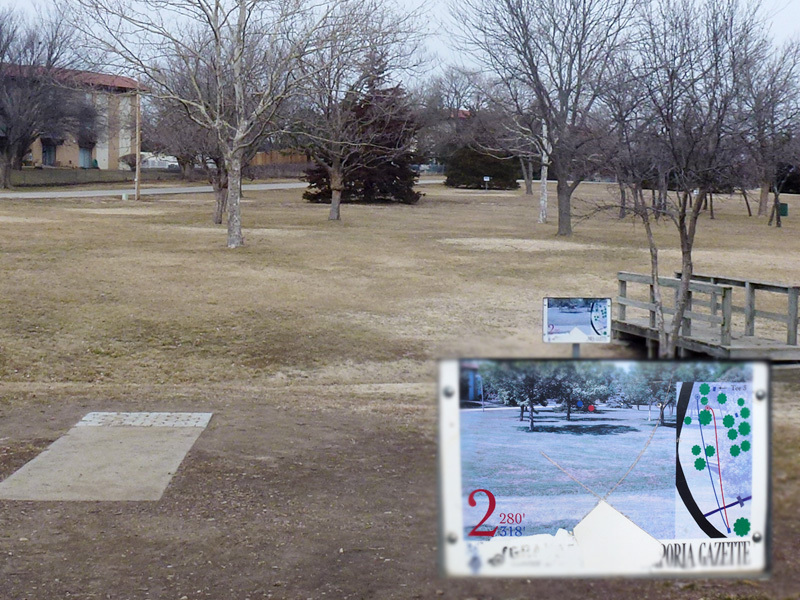 Additionally, you’ll want to get a feel for how your disc acts when it lands on the putting greens. This won’t be news to any of you who know JT here at Dogleg DG, but I’d like to let the rest of the world know that his design came out on top in the search for dgNOMAD’s new logo, and we think it rocks! Thanks also to everyone else who sent drawings, there were several contenders. If you need need any logo or promotional work done you can stop looking, JT did an excellent job for us. From concept to revisions to final drafts, as well as staying in touch and putting up with my busy schedule, he was on top of it all. The new logo looks awesome printed in black on our red carry bags, and the color version does a great job displaying the “UV-ness” (JT coins terms as well as designs logos!) of our newest product, retrofit Glow Chains. Our Glow Chains snap easily to any existing basket or target in under a minute and give glow golf a whole new meaning! Check them out here . And speaking of Glow Chains, if you’re in western Pennsylvania or Northeast Ohio you can see them in action at Young’s Run DGC during Valley DGA’s Glow Throw! The first of the monthly events is May 10th, check in a 7:00 for the first 9 and after dark the Glow Chains are coming out for the next 9! If you miss this one try back, there’s one every month May to November. More info at ValleyDGA.com or email info@valleydga.com. Trevor at Valley DGA has done a great job helping spread the word on our new chains to some neighboring clubs, anyone else who is interested in a club purchase for glow leagues or tournaments (or just to get a discount!) should definitely let me know. Club orders get 10% discounts and free shipping, email club@dgNOMAD.com for details. 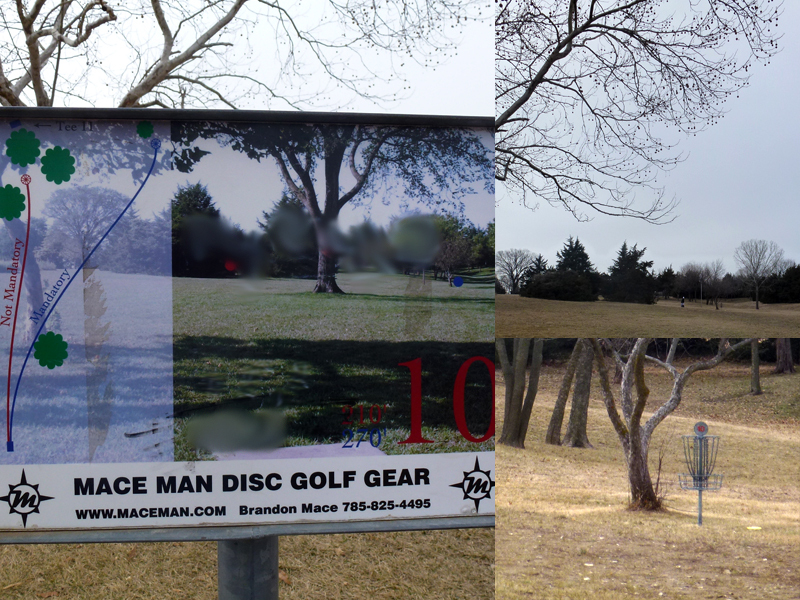 Last but not least, there’s still a week left before our next drawing, register to win either a set of dgNOMAD Glow Chains or one of our revolutionary ultralight portable NOMAD Disc Golf Targets! These little guys are under 3 pounds, available in 6 standard and 4 Glow colors, and let you take a target places you never thought possible…toss one in your backpack, on your dash, or even on your bike handlebars and you can throw anywhere! 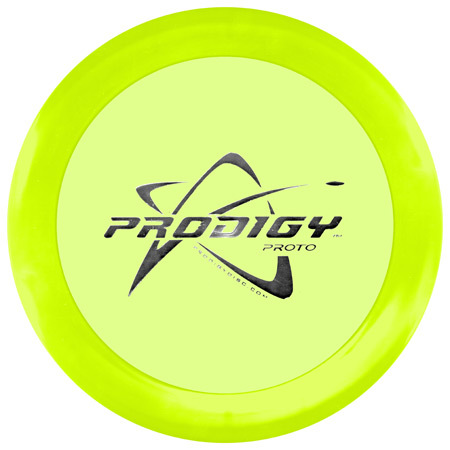 They have regulation size target zones, and in fact are the only PDGA approved Object Targets on the market. In addition to being made in the USA, our targets are economical so you can grab one for yourself and give the kids their own! Enter the drawing for free stuff here. Thanks for checking out our new product! I’m really excited to share with you all the first of many photo-based course guides I plan on creating. I got the idea to start these when I realized that many members of the Dogleg community would not have the opportunity to practice the courses for Amateur Worlds until they arrived for the competition. 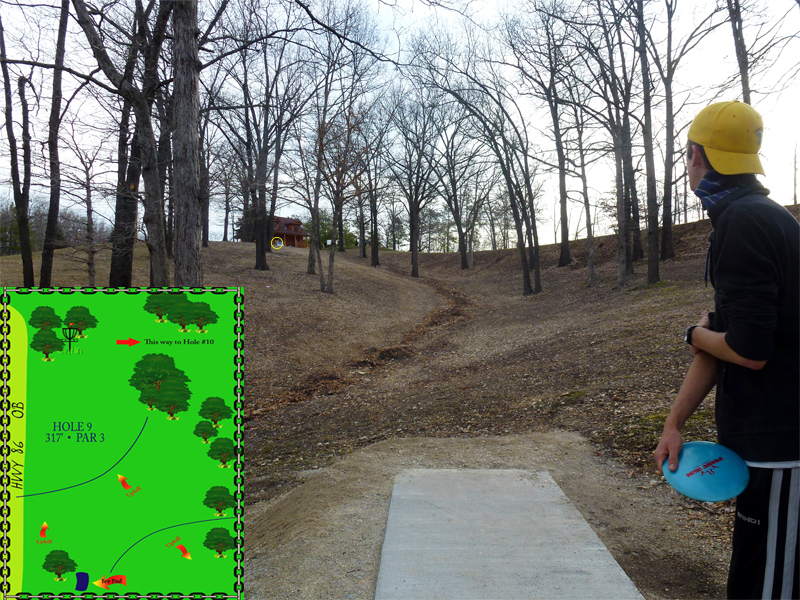 Since Columbia (my hometown) is only 3.5 hours away and St. Louis (where I go to school) is only 5 hours away, I figured I was in a great position to help non-Midwestern disc golfers prepare for such a big event. But, making a trip to Emporia was easier said than done. 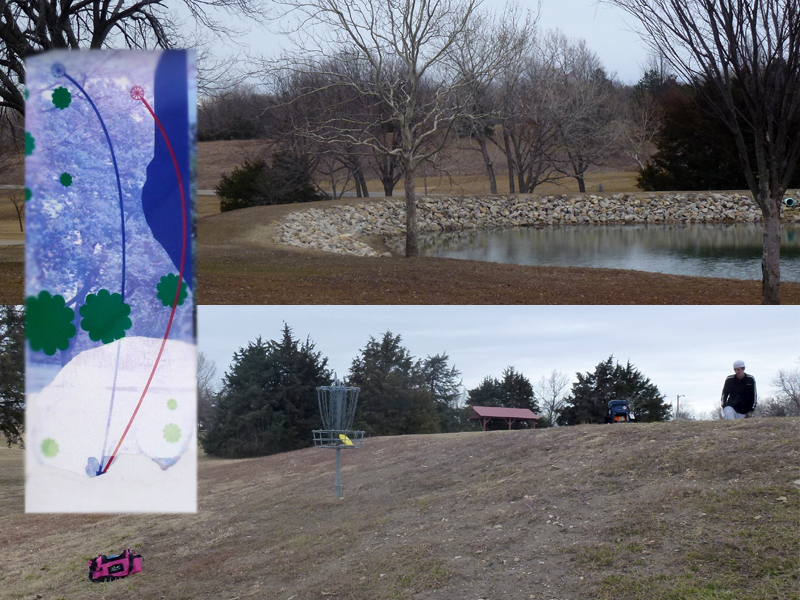 I sat on the idea for a month or two before Adam and I decided Valentine’s Day weekend would be the best time for us to take a disc golf trip. (Jealous? Refer to my last post: Love Is In The Air.) 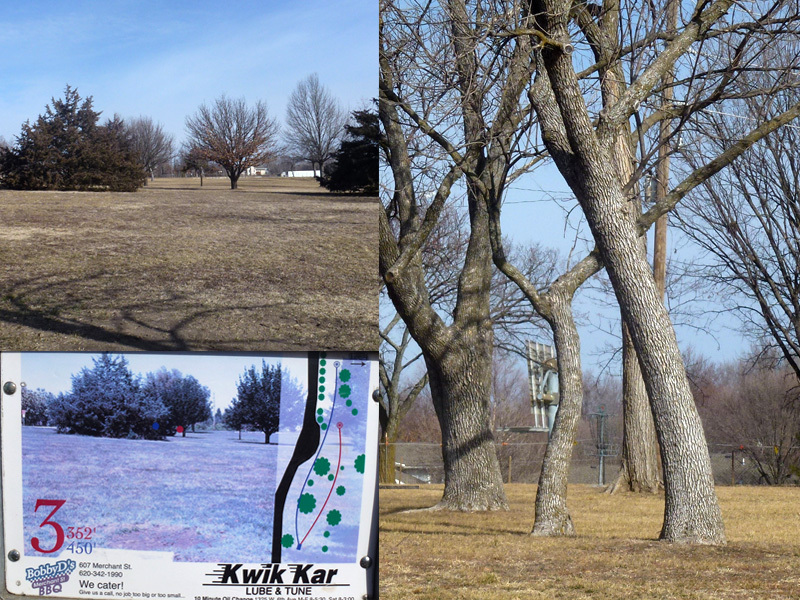 After a few near-death experiences caused by our failure to realize that some highways outside of Kansas City were icy, we made it safely to my first Emporia course: Jones West. 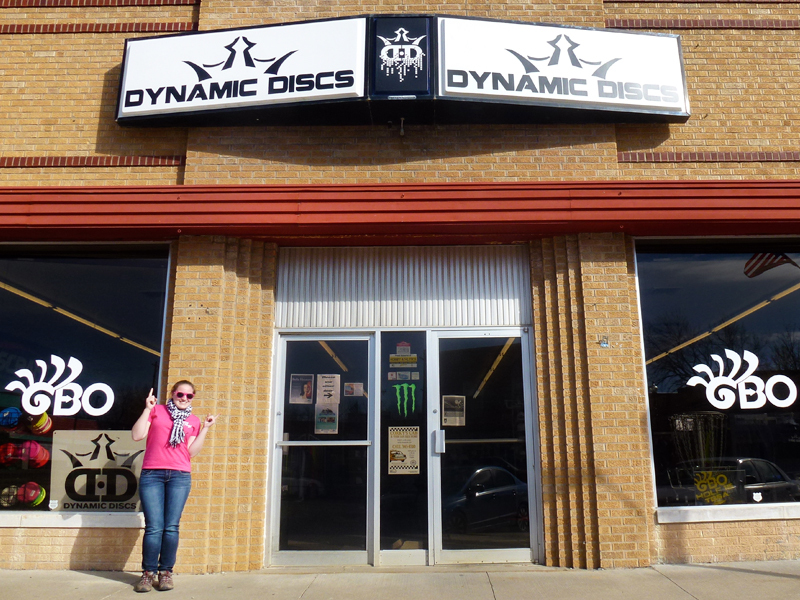 After playing the course, we swung by the Dynamic Discs store and talked with Adam Searle. 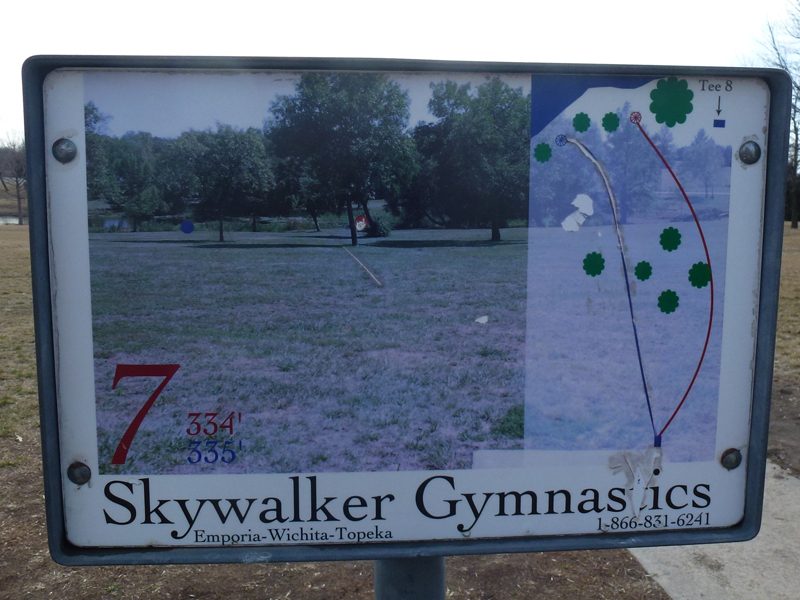 He said that all of the courses in the area will be getting new tee signs before hosting Am Worlds. (The ones they have at Jones West now are pretty nice, but several have been vandalized. 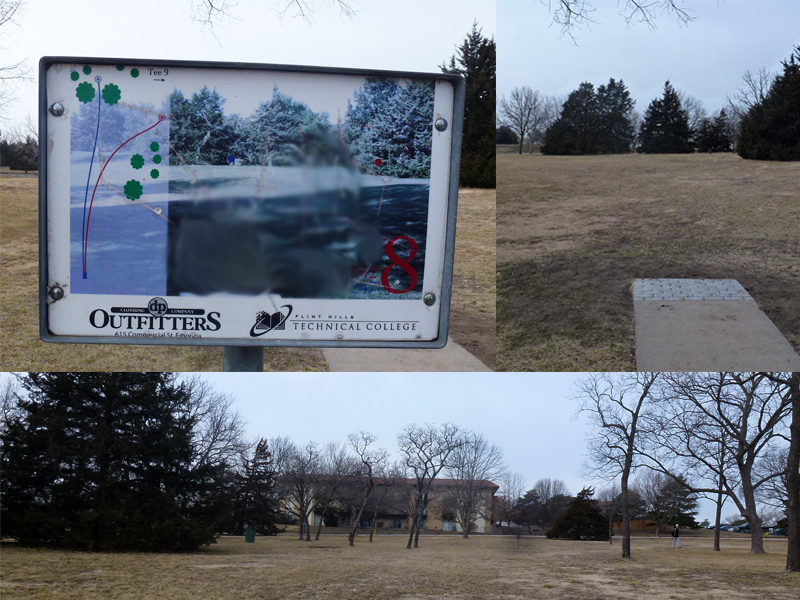 I edited most of the vandalism out in my pictures.) As of my correspondence with Dynamic Discs on Thursday, I learned that Jones West will not be used for the Glass Blown Open this year, but it will be for Am Worlds. 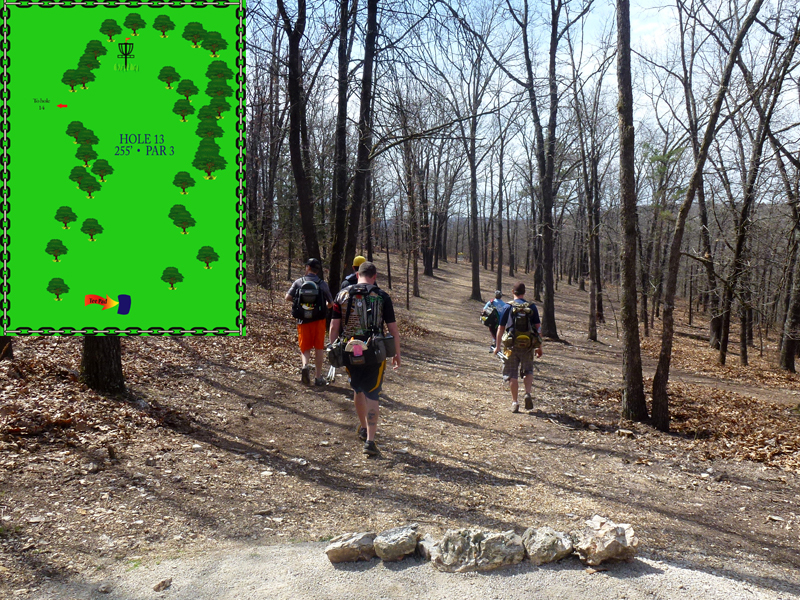 They are in the process of finalizing which pin placements will be used for the tournament. Now that I have all the details out of the way, enjoy the pictures! Working The Angles – Manipulate or Utilize? The first thing I said, and I would think most would agree, is that you need to understand how your disc flies naturally first. Not only how it is supposed to fly new, but how it will eventually fly after you have hit all those darn trees and broke it in. You can really only determine this with your own experimentation disc to disc since no one knows how much bark you’ve made fly! The rule of thumb with plastic is the cheaper it is, the quicker it will become understable with use. 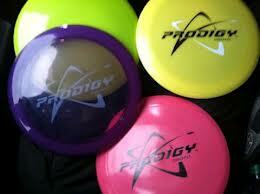 And for some plastics such as the Discraft Titanium plastic, that disc will fly the same as brand new forever. The Titanium plastic is close to indestructible. Don’t rely on expensive plastics to change flight characteristics too much over time. Also, more expensive is not always best. 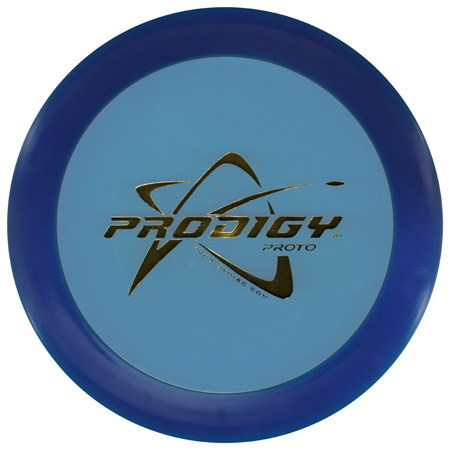 One of the cheapest plastics you can buy is the Discraft Pro-D, I have an XL Pro-D, and it’s a staple in my bag. It’s crucial for me because after years of use it went from stable to understable, and I now use it as a roller or a predictable turnover disc. Once you are very comfortable with how your disc flies (make sure you are using the same grip, speed, etc. to ensure predictability), then move on to manipulating your hyzer and anhyzer shots. With proper practice and experimentation you will know if a disc thrown flat will give you exactly what you need without the huge unpredictability of angling a hyzer or anhyzer.